Seafaring is a dangerous business. Be they sail or steam, passenger or cargo, many ships have gone down along the Atlantic Coast over the centuries. Powerful storms and strong, tricky currents make navigating harbors a challenge that in darkness is nigh unto impossible. Which is why man made lighthouses. Towers topped with bright lights visible for miles dot the coasts and Great Lakes of North America. 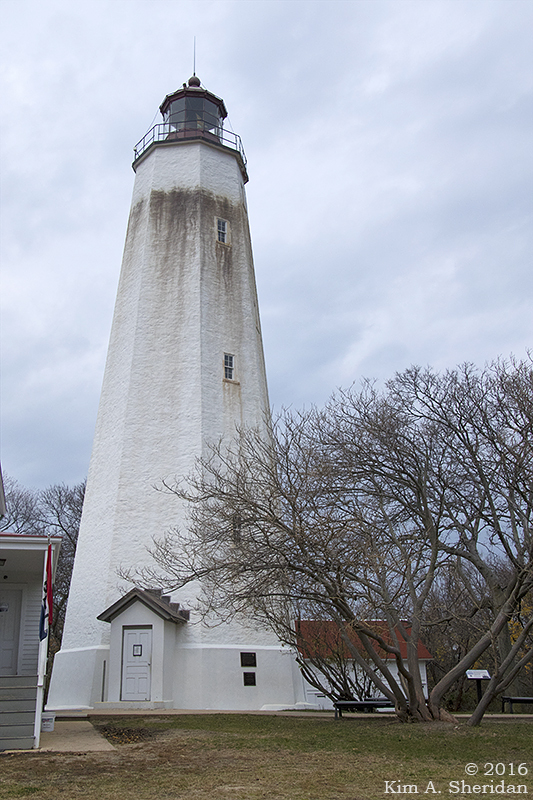 Sandy Hook Light has guarded the southern entrance to New York Harbor since before the American Revolution. 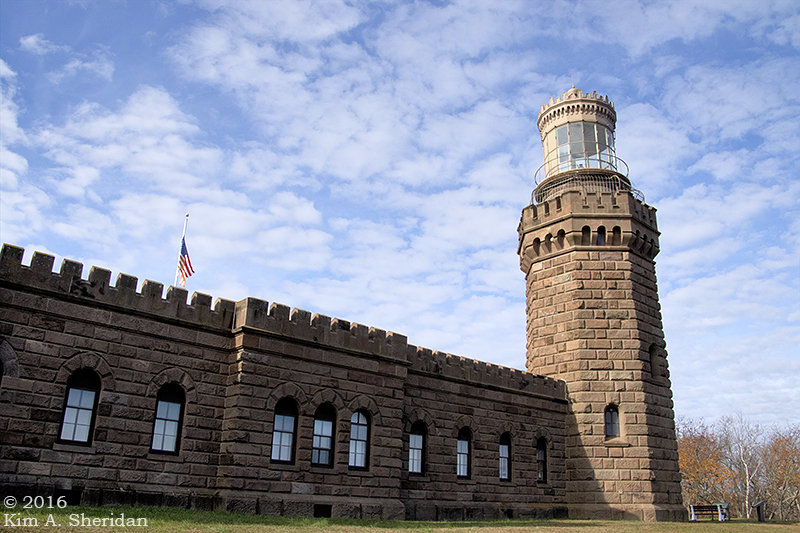 In 1828, help arrived: the Navesink Highlands Light Station, otherwise known as the Twin Lights. 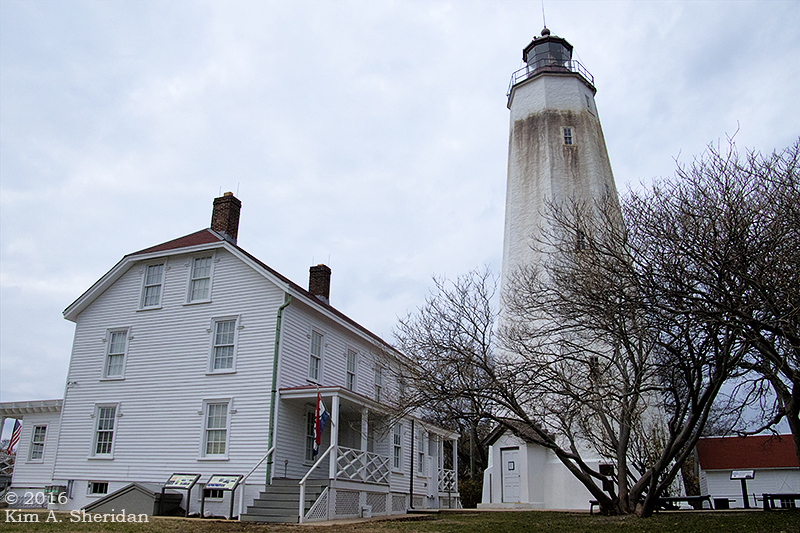 The name says it all – there are TWO lights to this light station. 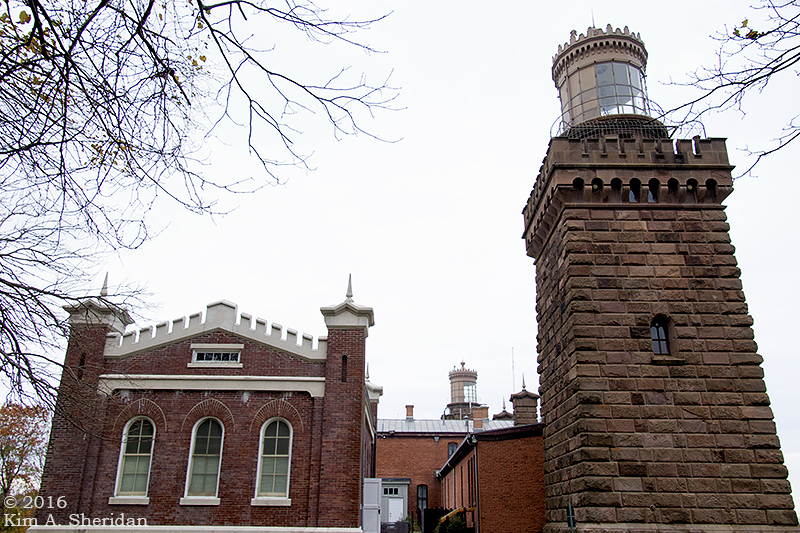 Rebuilt of local brownstone in 1862, the towers are linked by keeper’s quarters. 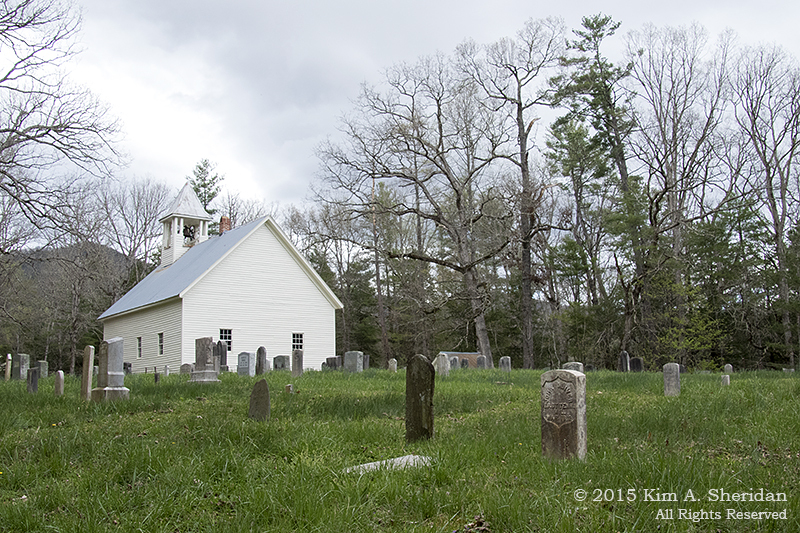 They stand 64 feet high atop a 200’ hill overlooking the Shrewsbury River. The two towers are different shapes, the North being octagonal and the South square. At night, the two beacons, one fixed and one flashing, were easy to distinguish from the light at Sandy Hook. They were also easy to see. 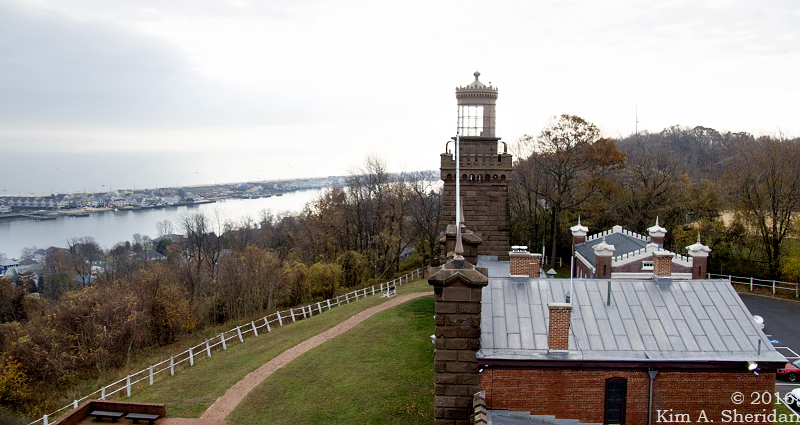 The Twin Lights were the first in America to use the revolutionary Fresnel lens design, when two of these beehive shaped lights were installed in 1841. 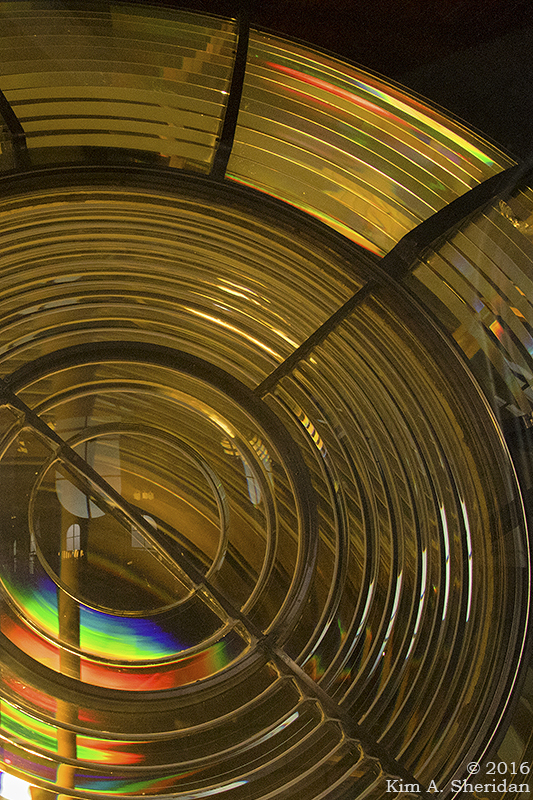 The South Tower’s beehive light was replaced in 1898 with an electric-arc bivalve lens. This light could be seen 22 miles out to sea, the brightest light in the U.S. at the time. It was so bright the North Tower light was taken out of service. 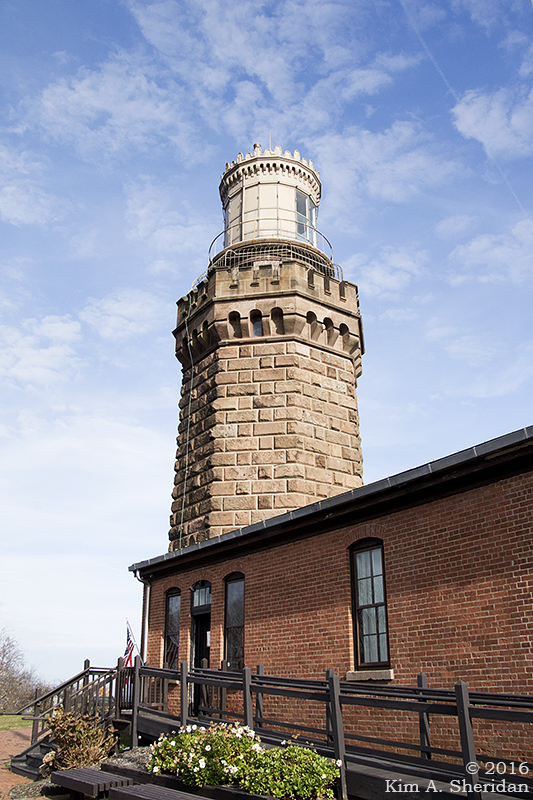 In 1941 Navesink Light Station was decommissioned and extinguished. The 9’ bivalve lens needed its own generator to power it. 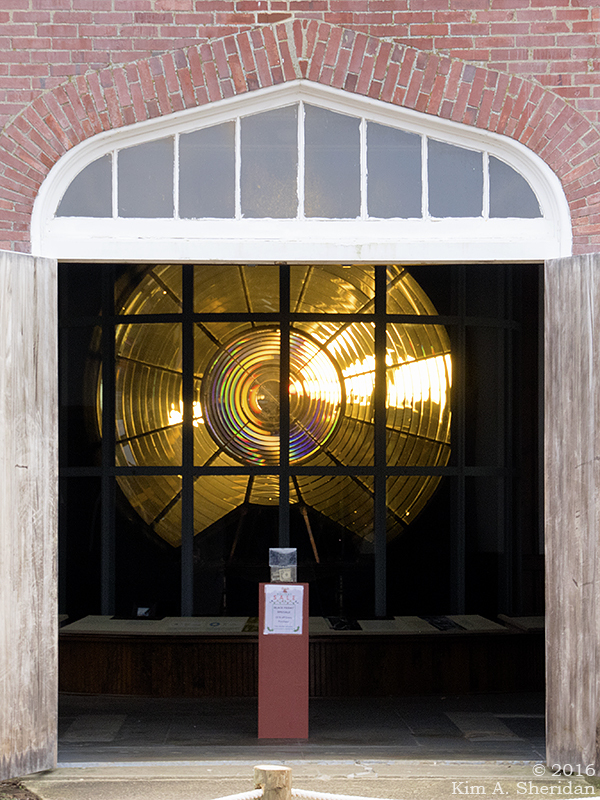 Today that lens is on display in the Electric Power Station building. Close up of the bivalve light. The front of the building that connects the two lights. 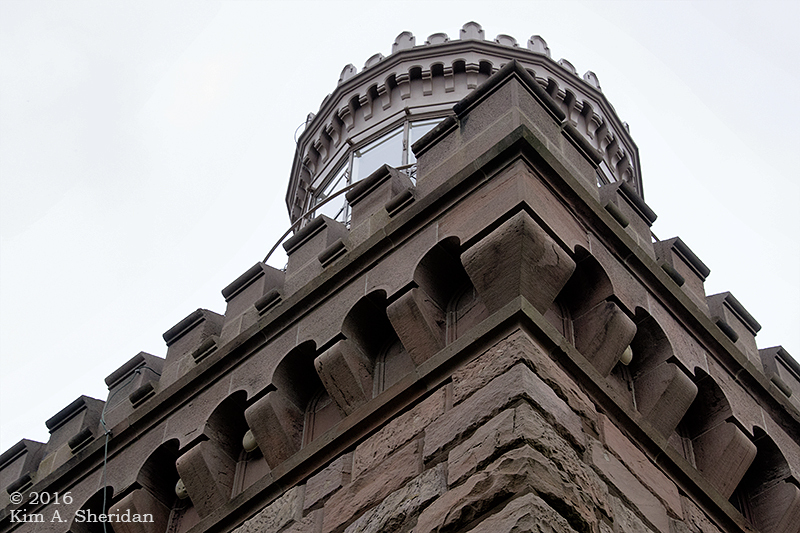 The battlements along the roof and the towers at each end give the Twin Lights a fortress-like feel. 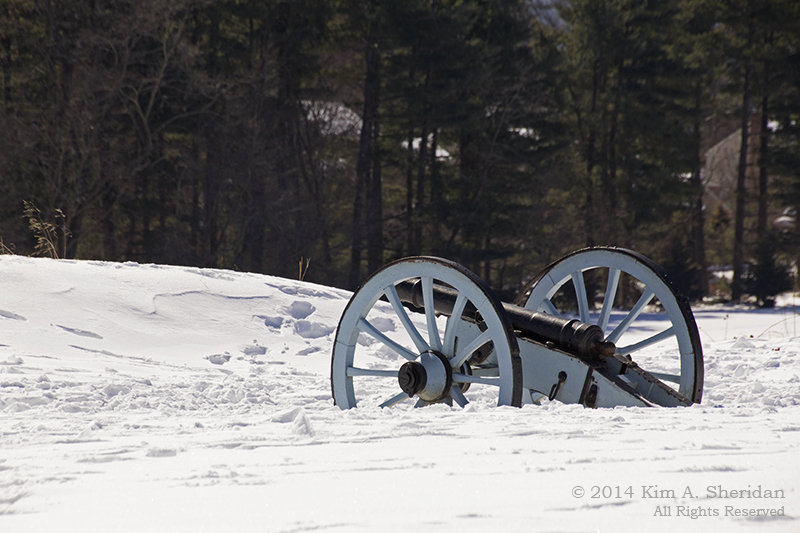 The cannon adds to the ambience. 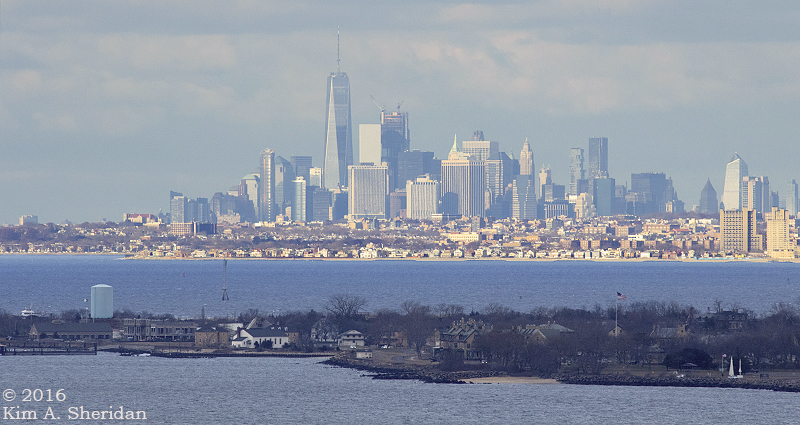 On clear days the New York skyline is visible from the Twin Lights site. So is the Statue of Liberty, according to Robb. The view from the top of the North Tower. The South Tower and the Shrewsbury River. Looking across to Sandy Hook. The first demonstration of Marconi’s wireless telegraph took place here in 1899, at the America’s Cup yacht races off Sandy Hook. Now a National Historic Landmark, this life-saving light station reminds us of the years it stood watch over the harbor, its beacons a comfort to all who passed. 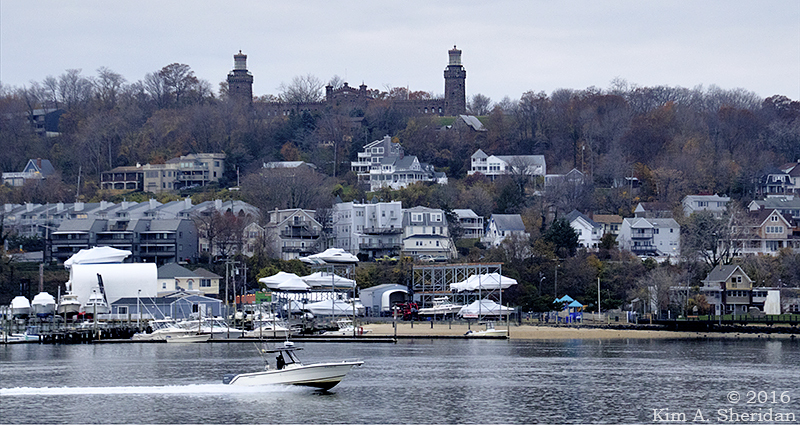 The Twin Lights of Navesink. HOEK (Dutch): Corner, angle; spit of land. 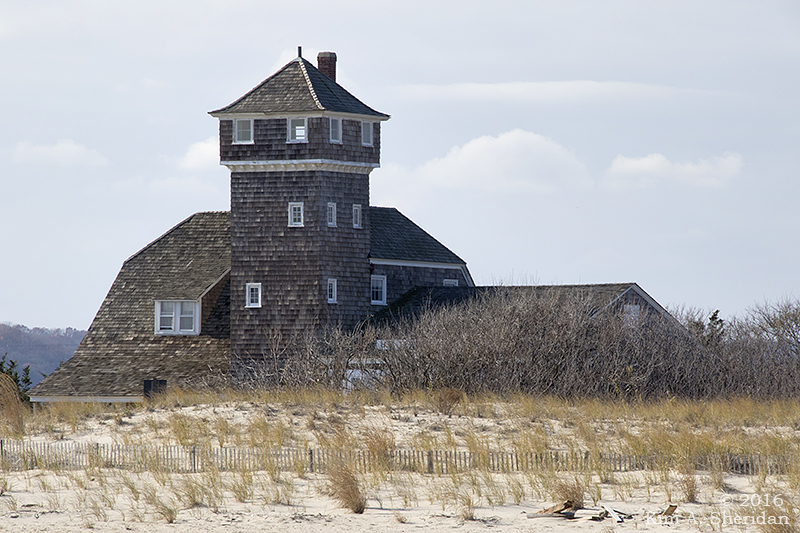 The long spit of land known as Sandy Hook, comprised of beaches, dunes and maritime forest, is a recreational wonderland. It serves a higher purpose, though. For centuries the spit has guarded the entrance to New York Harbor. The peninsula, owned by the federal government since 1814, has long been essential to the safety of mariners and the defense of New York. 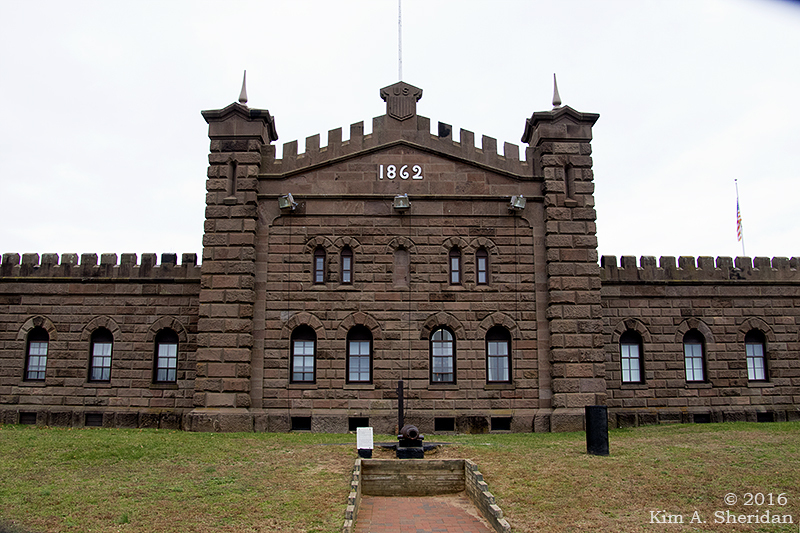 There’s a lot of history resting on the shifting sands of Sandy Hook! 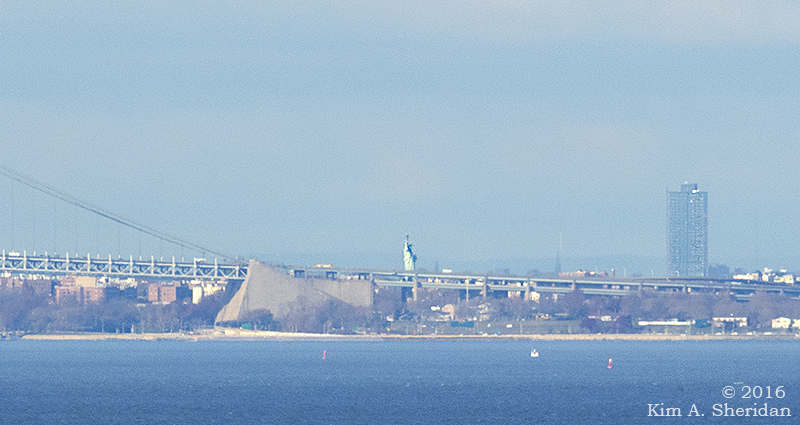 New York Harbor is one of the busiest in the nation. Seafaring is always treacherous, and many ships foundered off the Jersey Coast. In the 1870s, the U. S. Life-Saving Service was established, to watch the coast and rescue stranded seamen. Life-saving stations like this one were built along the coast. Spermaceti Cove Station No. 2, built in 1894, housed a six man crew of “surfmen” and their rescue equipment. The Spermaceti Cove station was used by the Life-Saving Service and subsequently by the U.S. Coast Guard until the 1940s. 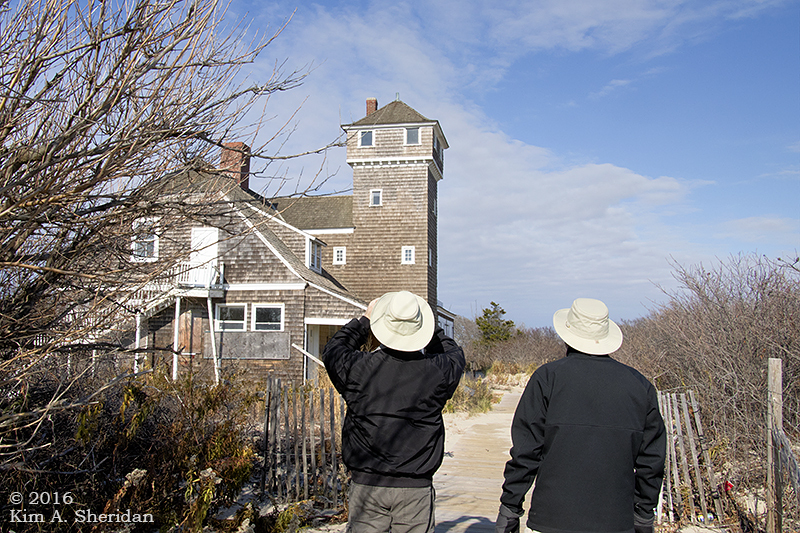 It has served as the Visitor Center for the Sandy Hook unit of Gateway National Recreation Area since the 1970s. Damaged in Hurricane Sandy, it’s now closed, to our deep disappointment. We could only admire the old girl from the outside. Also guarding the harbor is the Sandy Hook Light. First lit in 1764, it was captured by the British in 1776, withstood an American attack, and was held until the end of the Revolution. The Lighthouse Keeper’s Quarters now standing on the site was built in 1883. It also saw life as a U.S. Life-Saving Station. 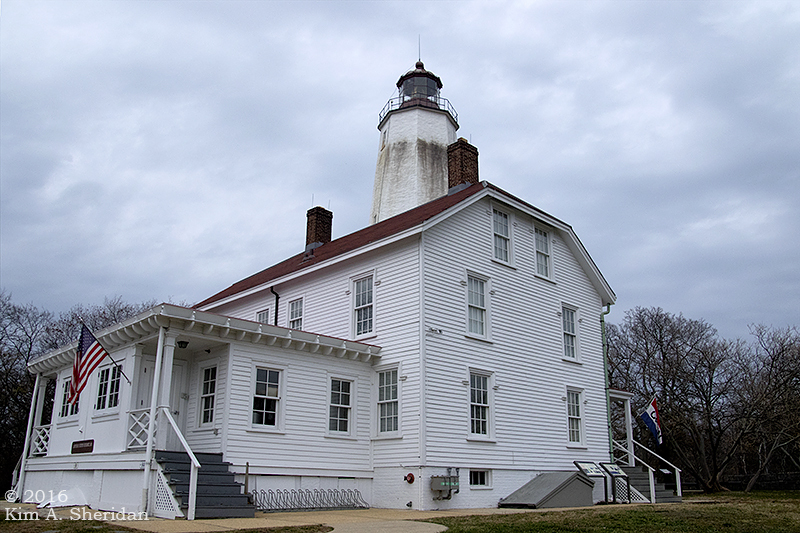 Sandy Hook Light is still in operation 24 hours a day, using an automated, fixed 3rd-order Fresnel lens. 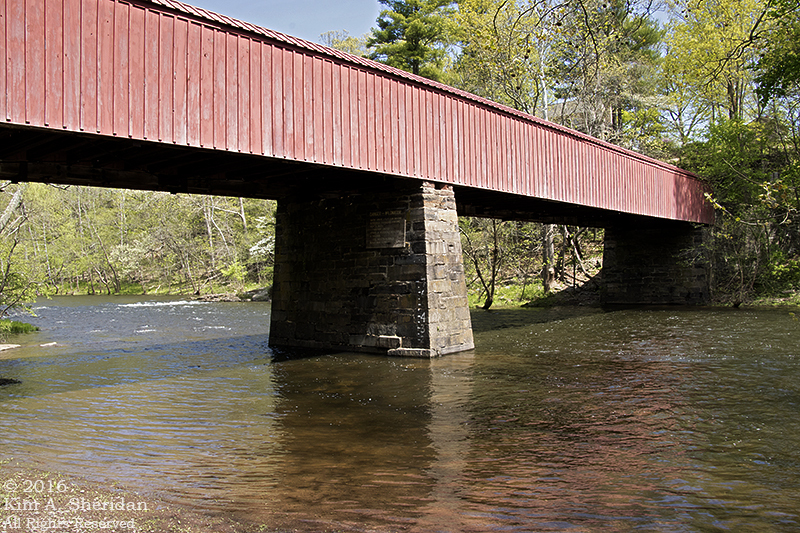 When it was built in 1764, water lapped the shore just 500 feet away. 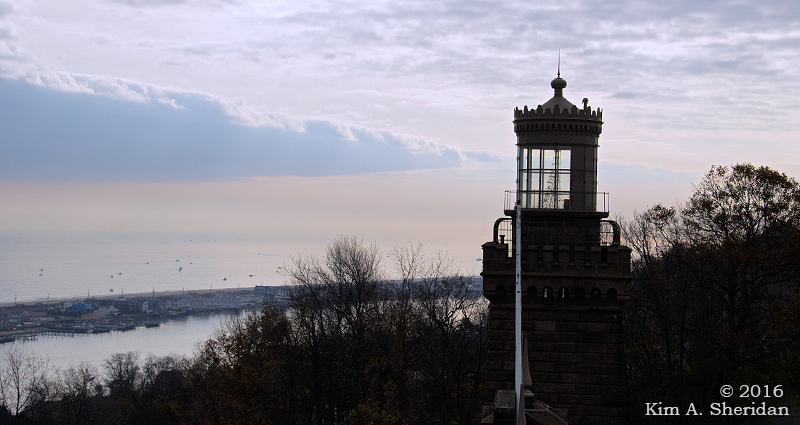 The light now stands a mile and a half from the tip of Sandy Hook. We took advantage of a chance to climb the 103’ tower. 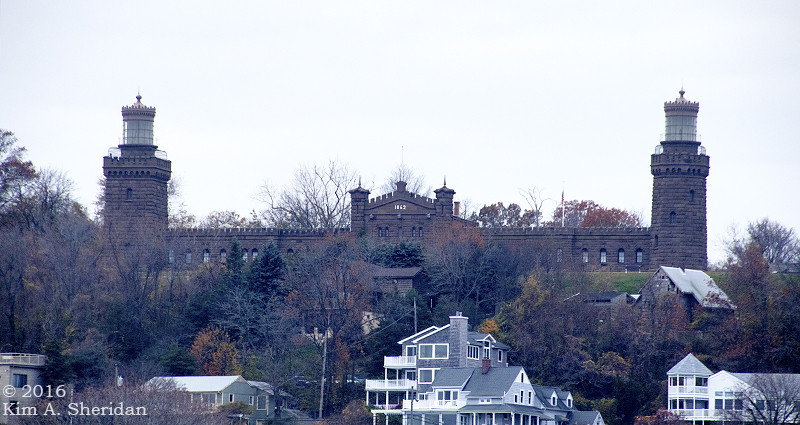 Along the way, deep set windows gave peek-a-boo views of Fort Hancock below. 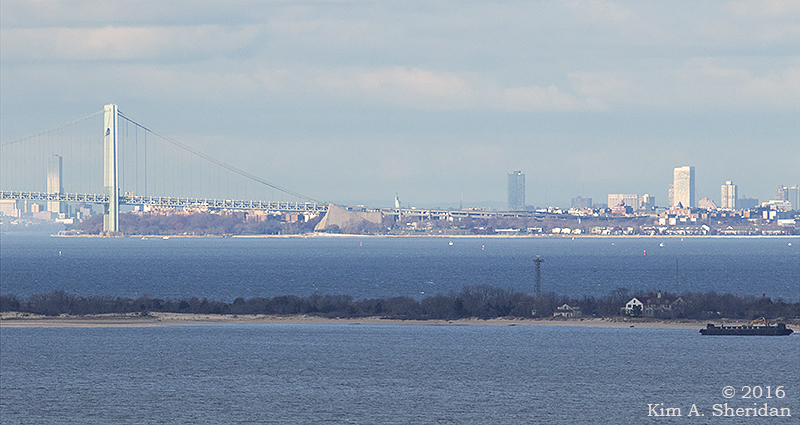 Sandy Hook’s location at the mouth of New York harbor made it the perfect place to build a fort to defend the harbor and New York City. A wooden fort called Fort Gates served during the War of 1812. Fort Hancock replaced it in the late 1800s. 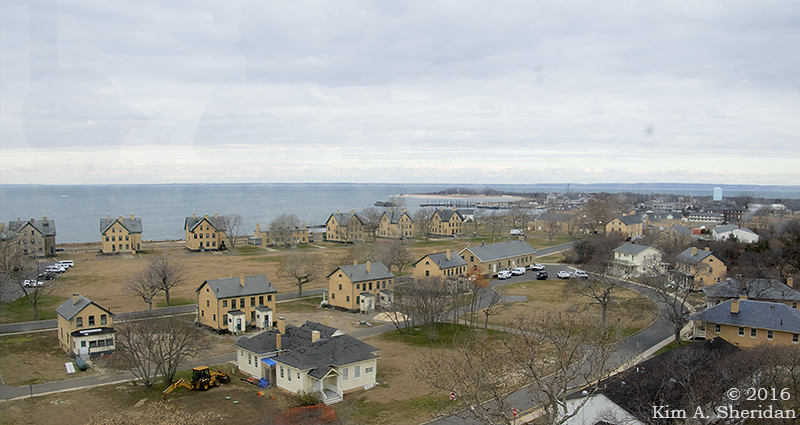 A view of Fort Hancock from the lighthouse. This is Officers Row, a group of yellow brick residences. 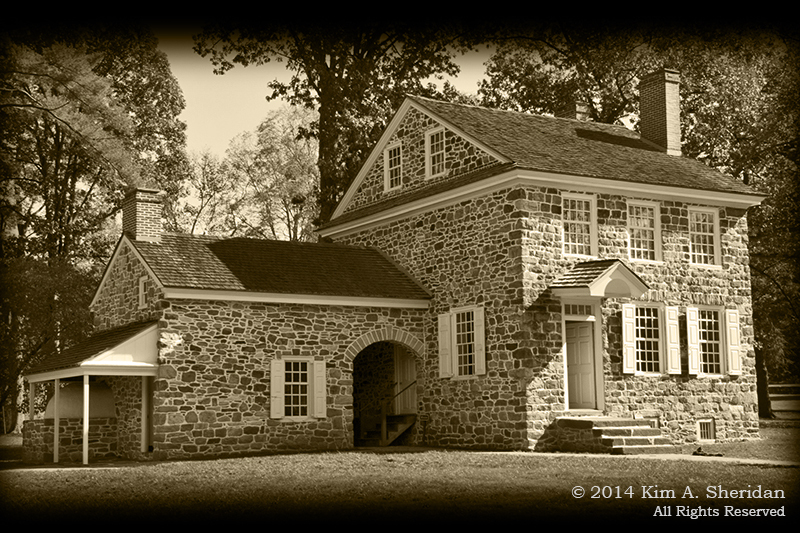 Enlisted men lived in barracks and a small village of supporting buildings sprouted up over the years. The population of Fort Hancock peaked during World War II at nearly 12,000 military personnel. 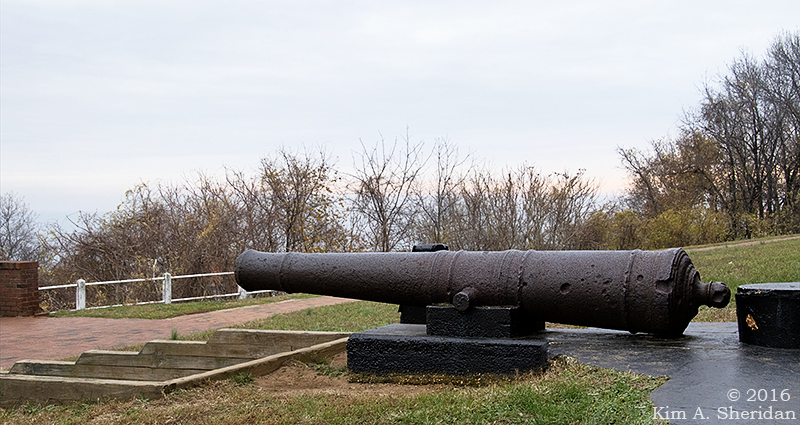 Much of the fort’s defenses centered on concrete gun batteries using the most powerful cannons of the day. 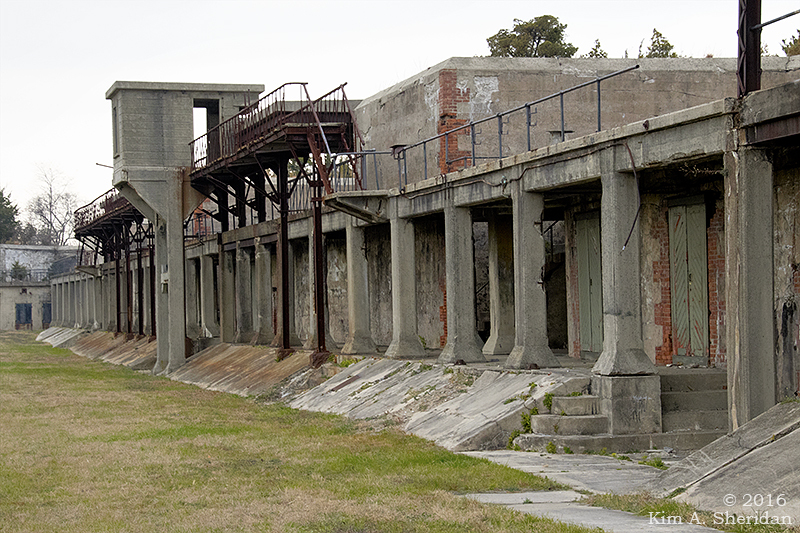 After WWII, the fort’s mission shifted to an array of Nike air defense missiles. 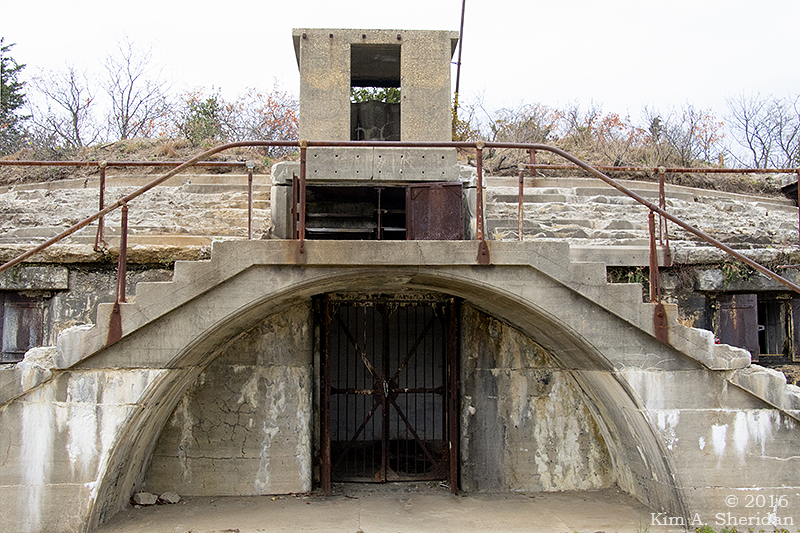 At the end of 1974, Fort Hancock was officially decommissioned. 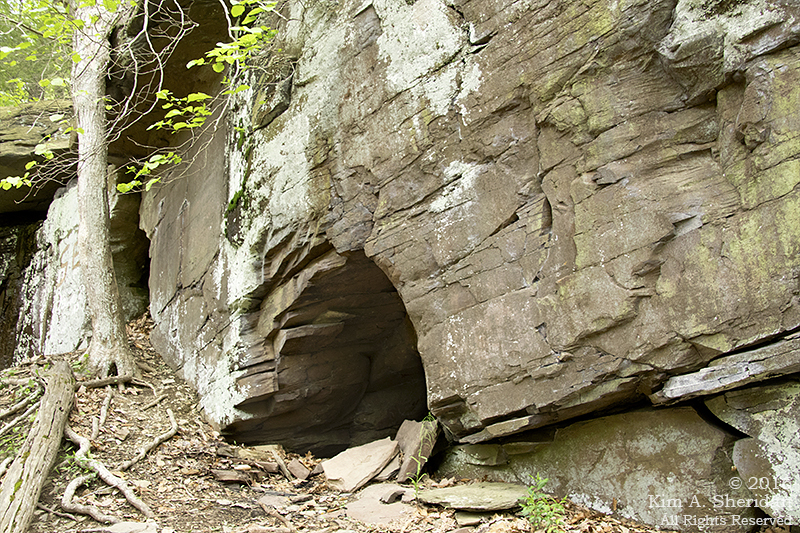 It now is part of Gateway National Recreation Area. 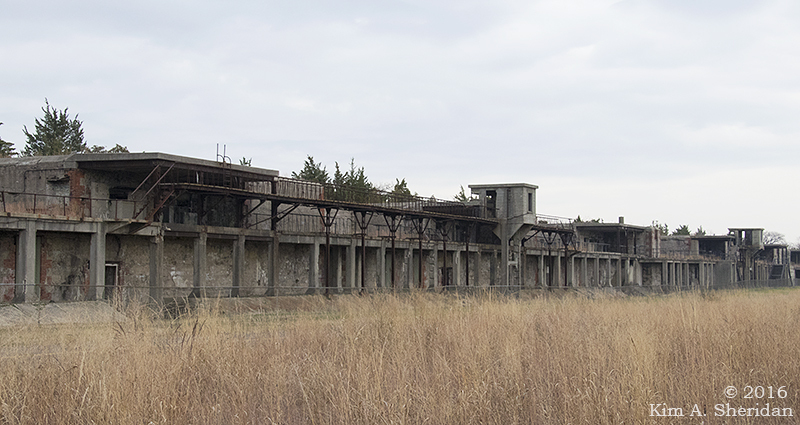 These old gun batteries were quite picturesque, in a moody sort of way. 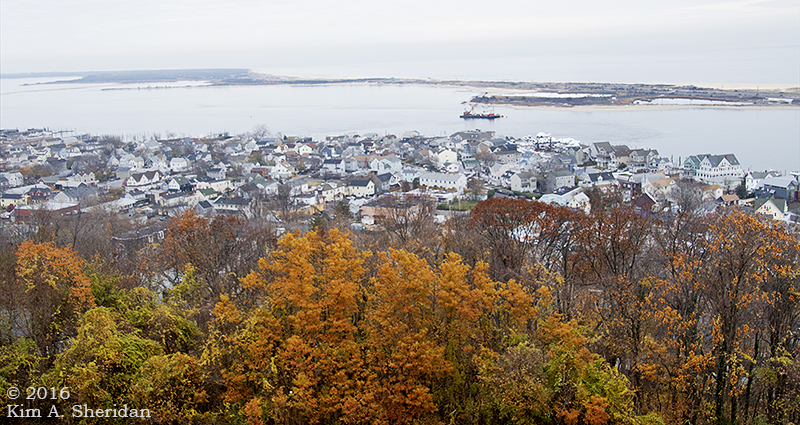 Near Sandy Hook, in Atlantic Highlands, is Mount Mitchill Scenic Overlook. 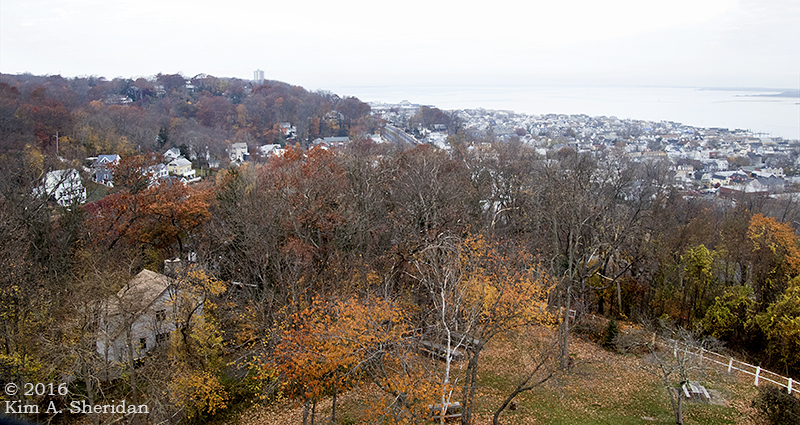 Perched at 266’, the highest natural elevation on the Atlantic Coastal Plain, it offers sweeping vistas of Sandy Hook, Raritan Bay and New York City. You get a feel for the strategic importance of Sandy Hook to the defense of New York and the safety of seamen traveling into the harbor. Throughout the weekend, from every high point and lighthouse, we searched for the Statue of Liberty. Throughout the weekend, from every high point and lighthouse, Robb claimed to see her. Don was skeptical. She never seemed to be where Robb said she was. After two days of following Robb’s guidance, to no avail, I sought the aid of other visitors to Mount Mitchill. Within minutes, thanks to them, I had found what I was looking for. There she stands, the symbol of freedom, the symbol of welcome to all who come to our beautiful land. And guarding her flanks, Sandy Hook, ever vigilant. BUCKS COUNTY, 1781… A band of ruthless outlaws known as the Doan Gang rob the Bucks County Treasury in Newtown of 1,300 pounds sterling. 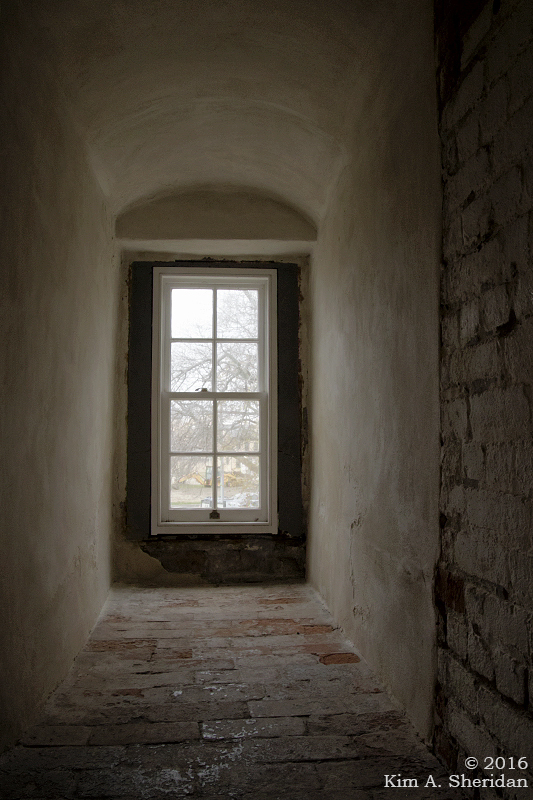 It was one of many crimes committed by five Quaker brothers and their cousin. Loyal to the British crown, the Doans made a career out of robbing Colonial tax collectors, stealing horses to sell to the British and even spying for the Redcoats. 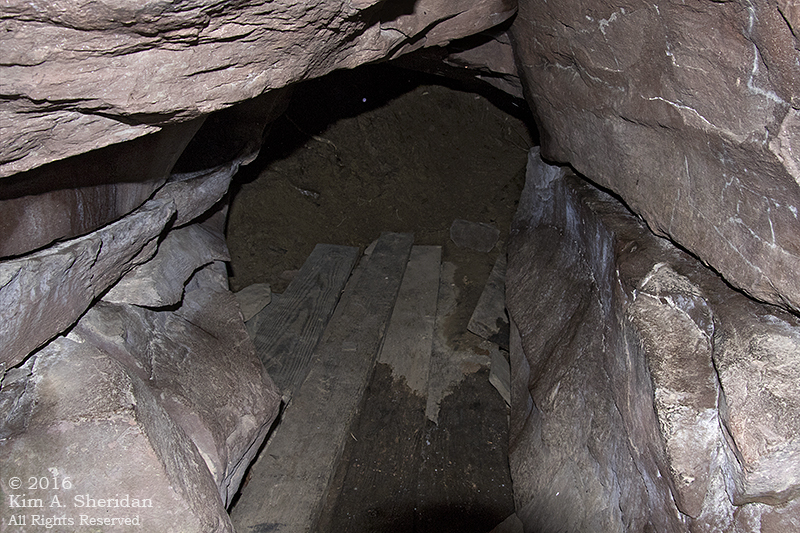 According to numerous legends, the gang amassed a small fortune, and stashed the loot in one or more caves in the hills of Bucks County. 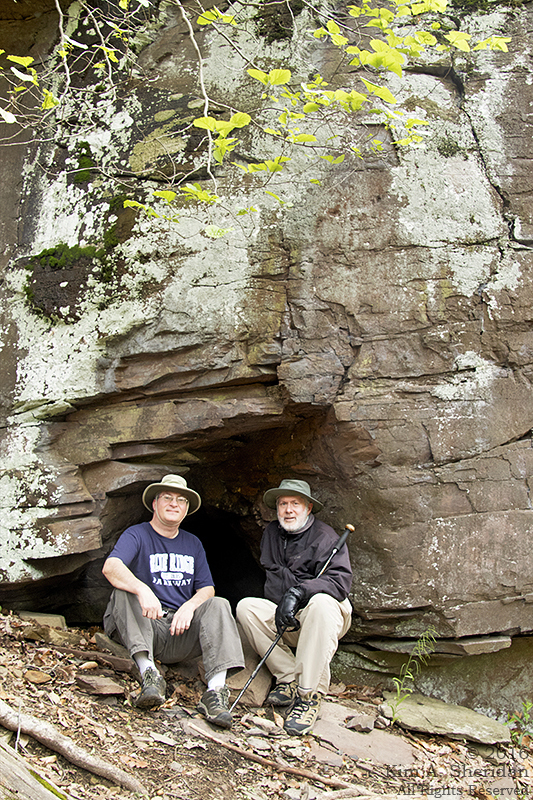 Well, that and a few Internet photos and postings that serve as a signpost to the impossible-to-miss cave. 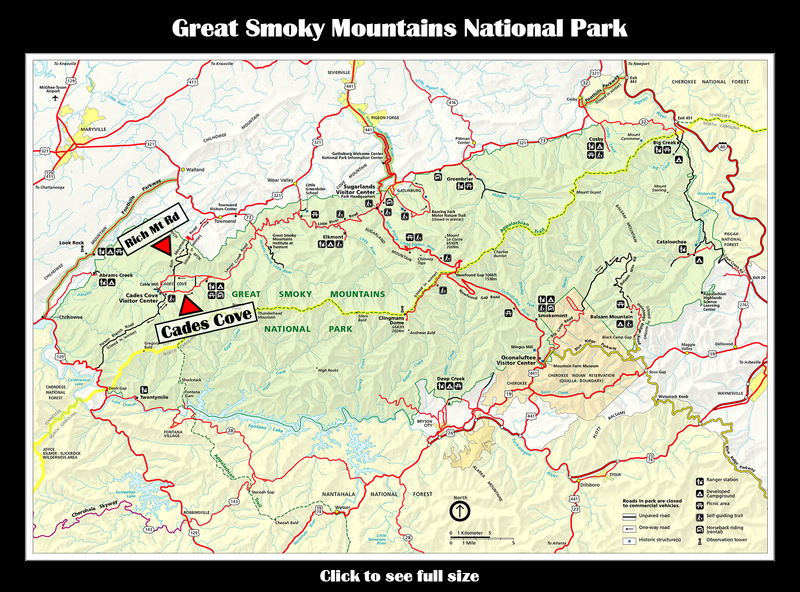 Conveniently, there’s a State Park, and a trail. The latter was a scenic walk along the creek, with a couple of tricky crossings over steep banked runs that fazed our daring adventurers not one whit. 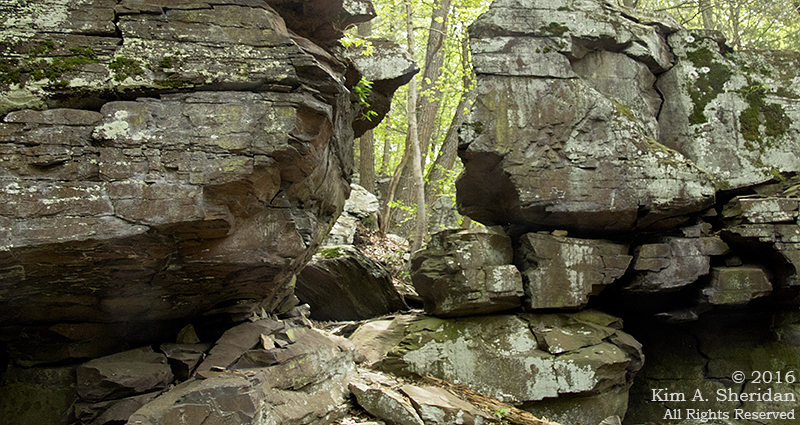 Soon enough, rock outcroppings began to appear on the hillside above them. Just the place for a cave. 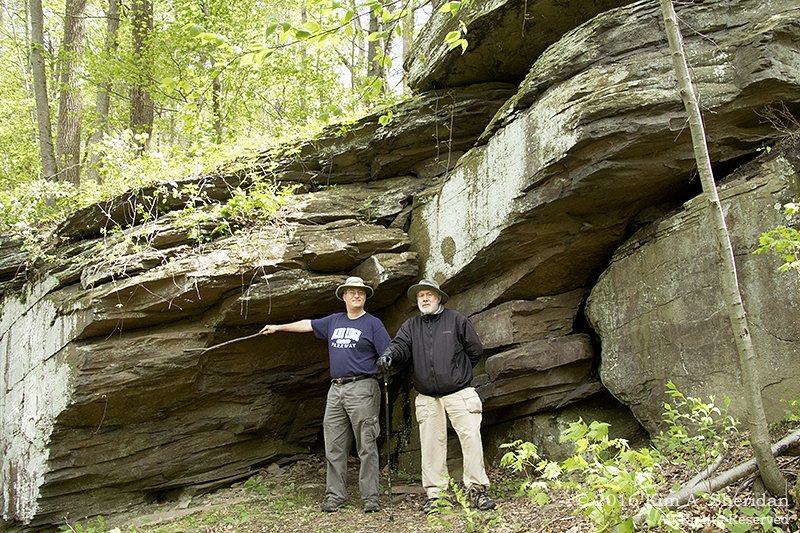 The first such outcropping held no cave, but sported an impressive covering of lichens and moss. It was also an irresistible place for some camera-mugging by the irrepressible Major Robb, not seen here. 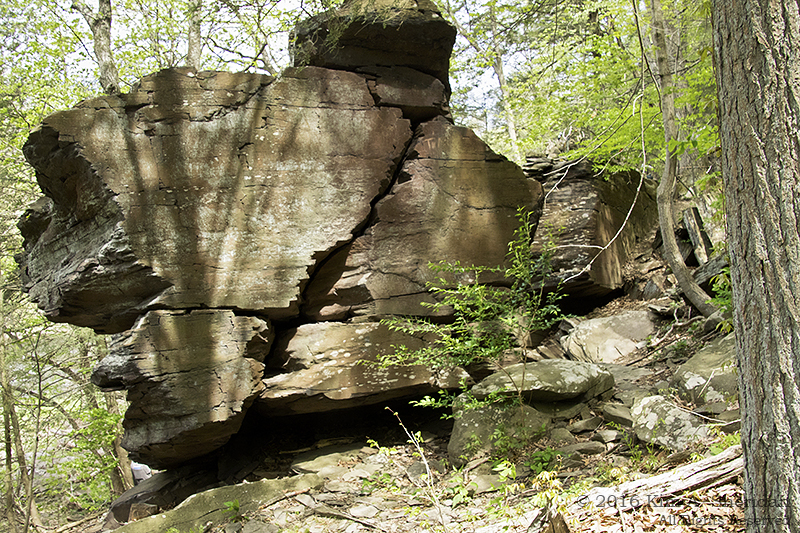 The next rocky formation had been cleft nearly in two on one end. Two trails split around it. Which to follow? 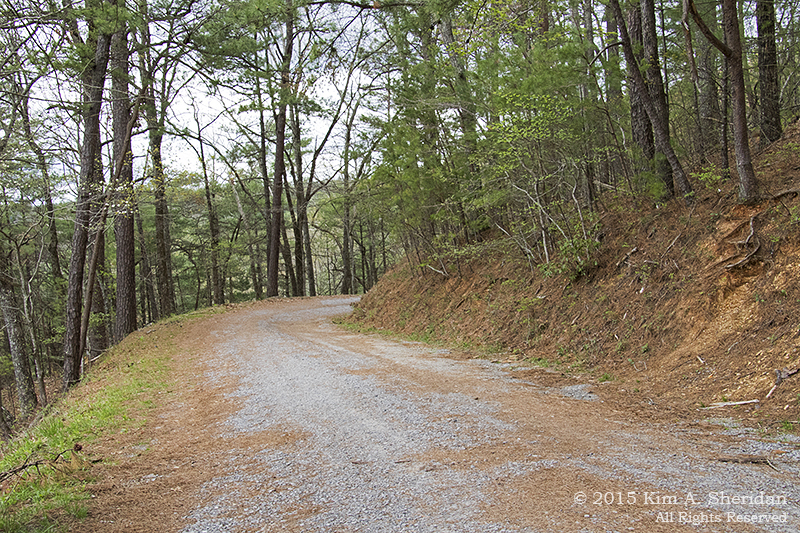 Left, and down, to the base of the rocks. Obviously our heroes were far from the first to seek their fortune here. Someone had even been kind enough to put down cushy floor boards for their fellow treasure hunters. 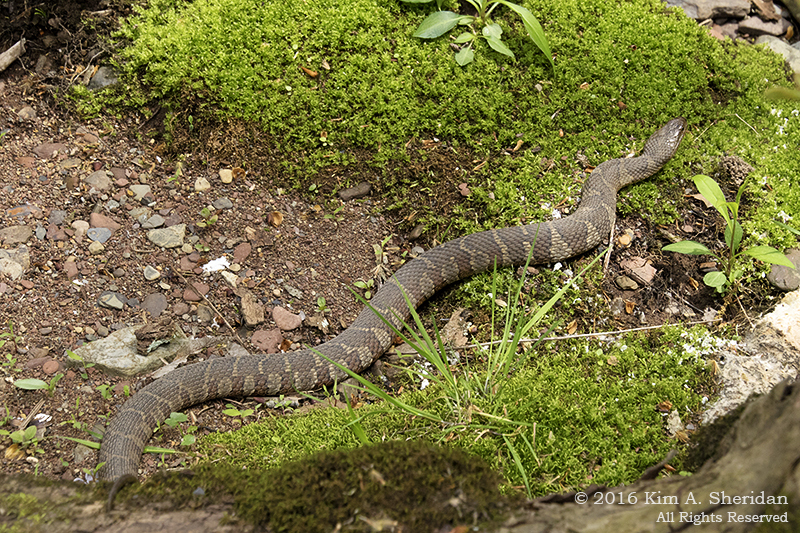 … And standing stalwart and resolute amongst the boulders. Why does Major Don look so sad? Clearly the disappointment of finding no Doan Treasure in Doan’s Cave weighs heavily upon his mind. 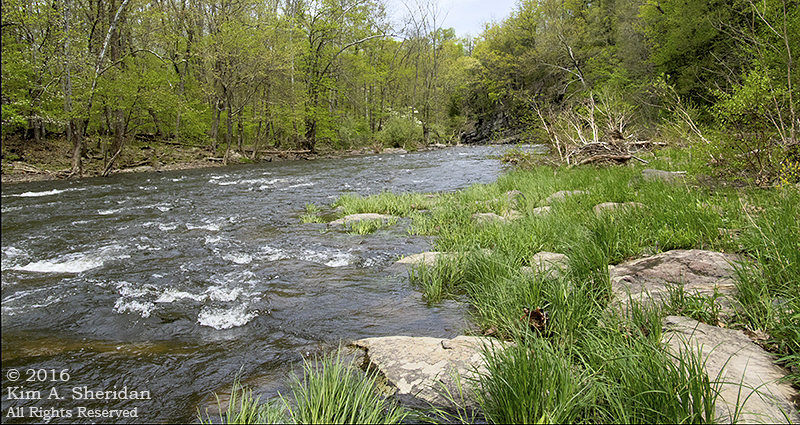 Being lighter of heart, the other members of the expedition make a foray to the shores of Tohickon Creek. Our fearless fortune-hunters, finding no gold or silver, went off in search of other types of treasure. This they found in spades on the far side of the creek. The footpath led over a covered bridge, which was in fact not covered at all. A faux bridge. 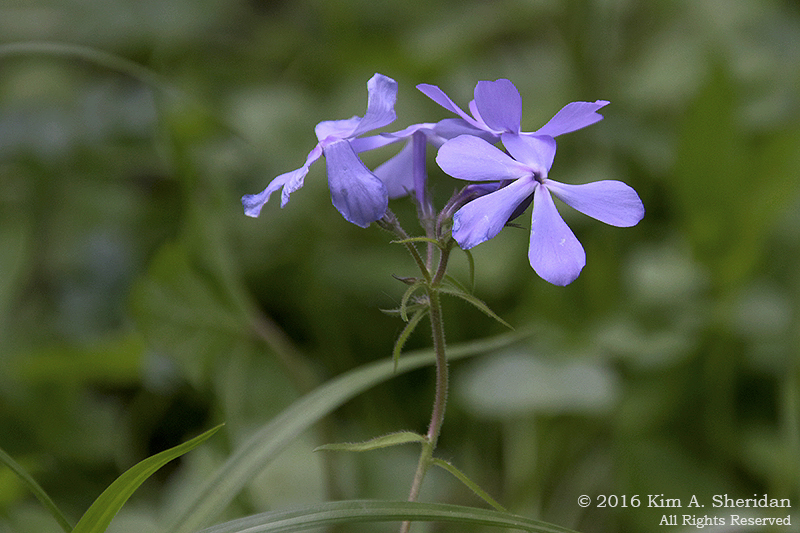 The creek-side path yielded a bumper crop of wildflowers. This was a source of boundless amusement for Major Robb, who busied himself attempting to identify each one. Conveniently for the rest of the expeditionary party, it got him out of their hair. 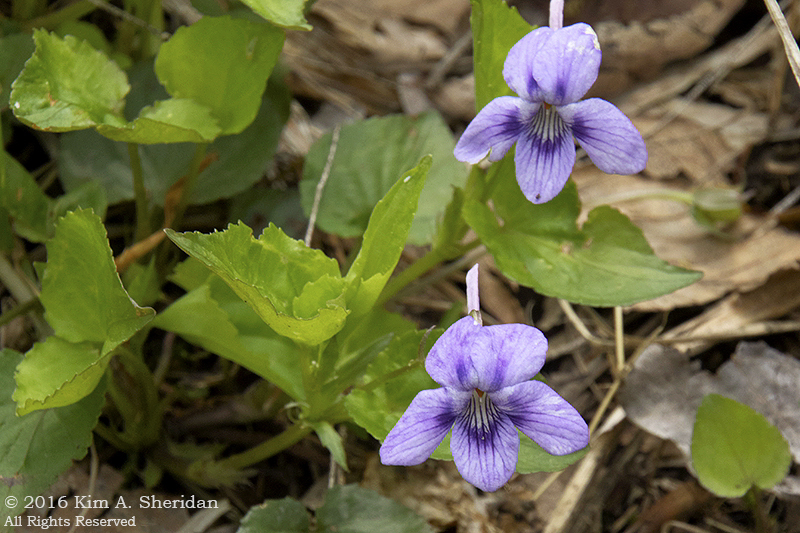 A violet, unnamed, but no less admired. Whilst Major Robb was so occupied, the others found their way across a dry gully onto an island of cobble and pebbles. 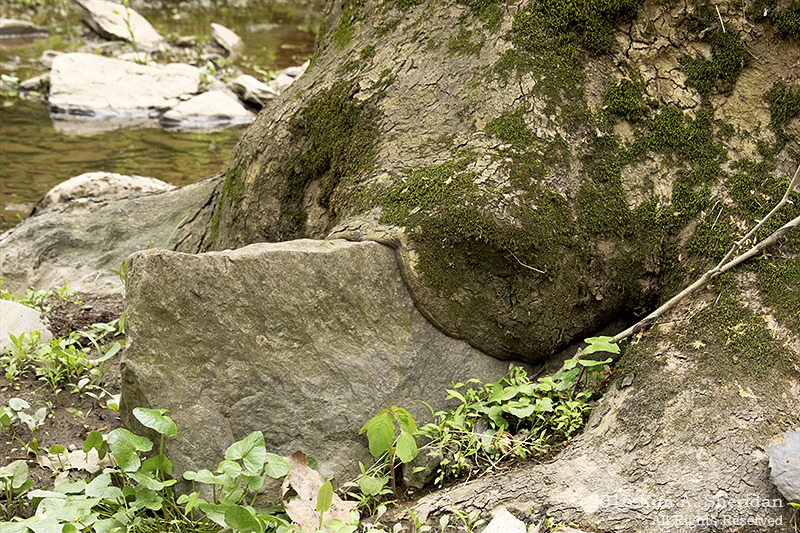 Here a tree was actively swallowing a large rock. In another hundred years, it might well succeed in digesting this stony meal. 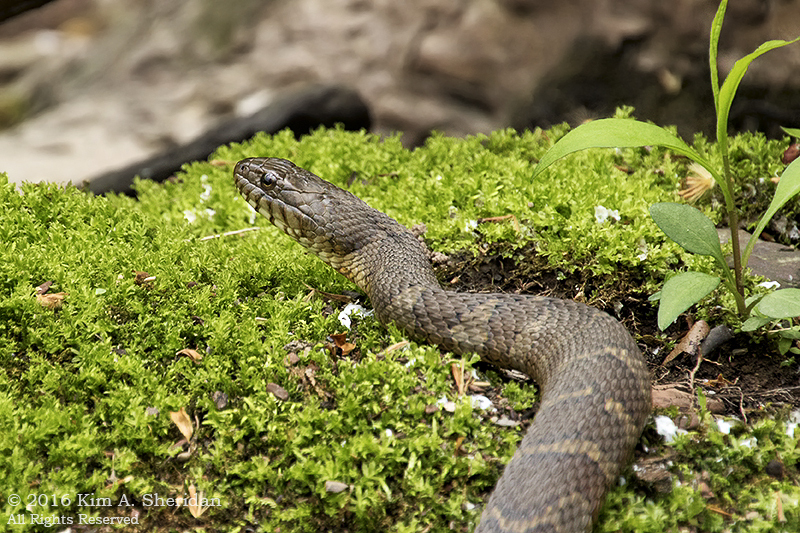 Corporal Kim was suddenly startled by the sight of a large snake at her feet, slithering away from her with all due haste. Seems the plucky lass had unwittingly trod upon its tail. 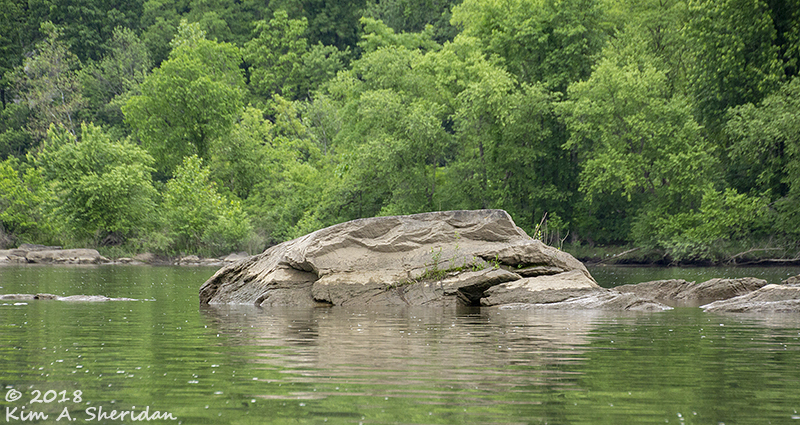 Upon reaching the water’s edge, it forgot its annoyance and fear, and posed quietly for a series of photographs. Tired, hungry, and quite bereft of treasure of any monetary value, our bold band of explorers bid farewell to Tohickon Creek. 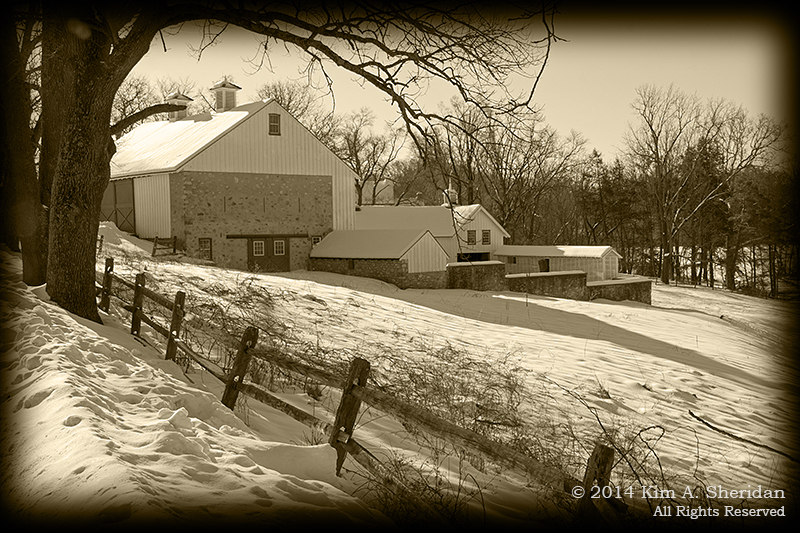 Quite content were they with the joys of a day well-spent amidst the natural splendors of Bucks County. Whatever secrets Tohickon Creek yet harbors, she guards them well. Listen closely, the old tree said, and I will tell you of the birth of a nation. 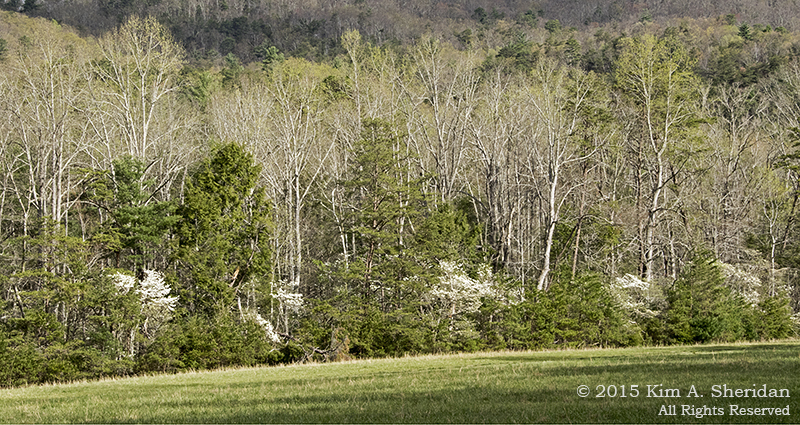 When I was but a young sapling, the rolling hills you see before you were dotted with farmsteads. 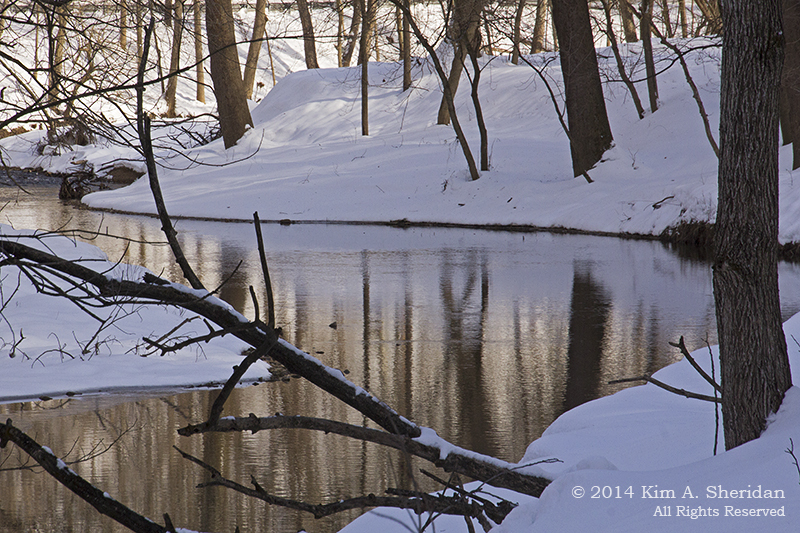 Valley Creek flowed past iron forges before joining the Schuylkill River to the north. 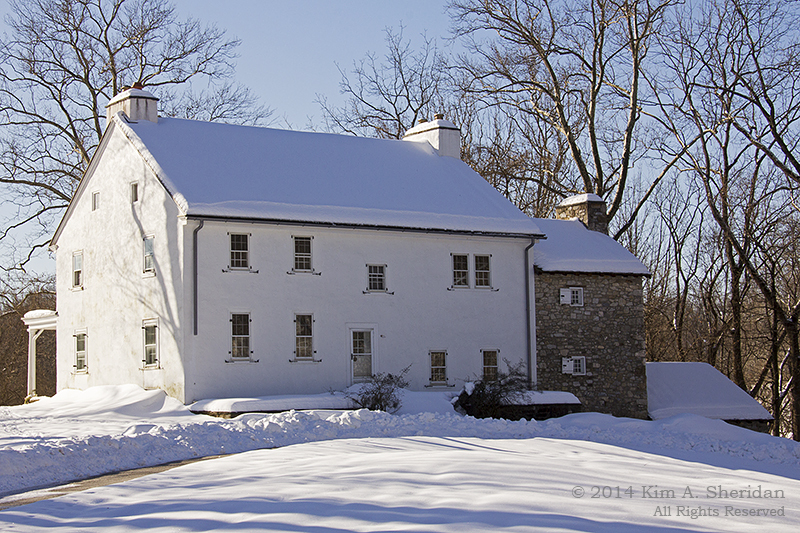 It was the winter of 1777, the heart of the American Revolution, when General George Washington decided my home provided everything he needed for a safe place to encamp his troops for the winter: easily defensible high ground, proximity to Philadelphia to pressure the British, the river nearby for transportation. 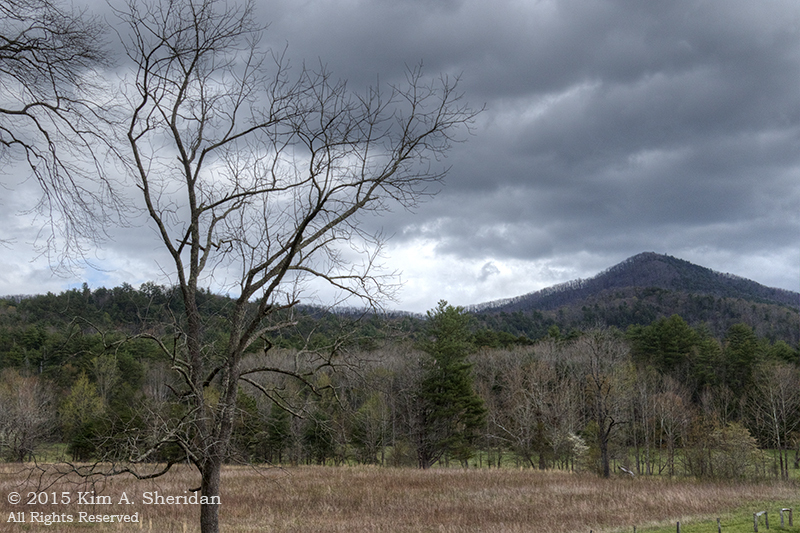 I watched as 12,000 men marched into the valley on December 19, weary, bedraggled, but with their heads held high. They swiftly pitched tents as temporary shelter, then busily set about building log huts. They would complete nearly 2000 of these huts, chinked with clay and laid out along military avenues. 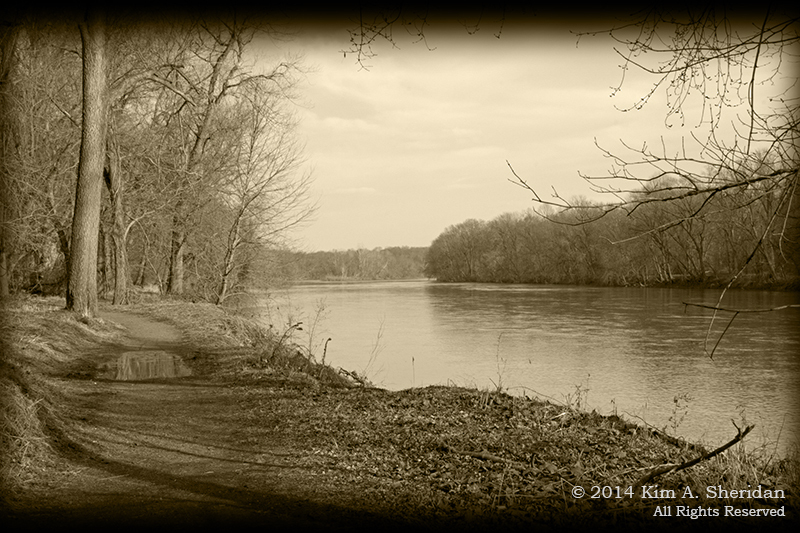 The men then fell to building defensive fortifications: trenches, redoubts, and a bridge over the Schuylkill River. Some of the officers made quarters in the houses of local farmers. It was more cramped than it may appear today. 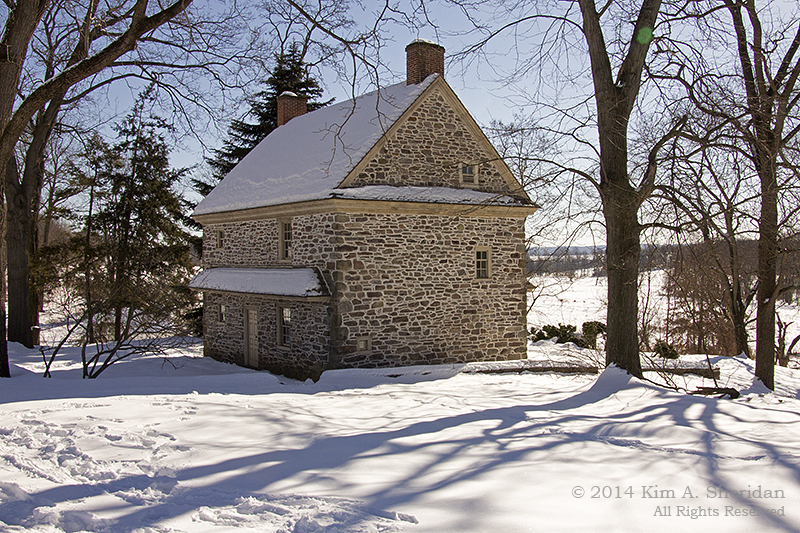 When General Henry Knox lived in the house above, it was half this size; expansion came after Revolutionary times. General James Varnum occupied only one room on the upper floor of this dwelling, below; the owner’s family continued to live in the rest of the house. 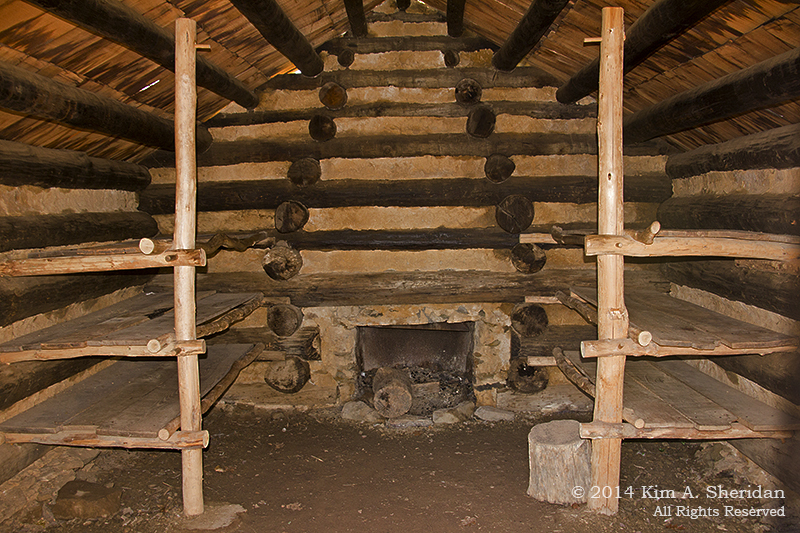 Many of the officers, including Knox and Varnum, would later move into huts to be closer to their men. Washington himself had vowed to stay in his canvas tent until all the men were in huts, but the needs of command compelled him to move to larger quarters. I have seen many winters in my long life, some mild, some harsh. 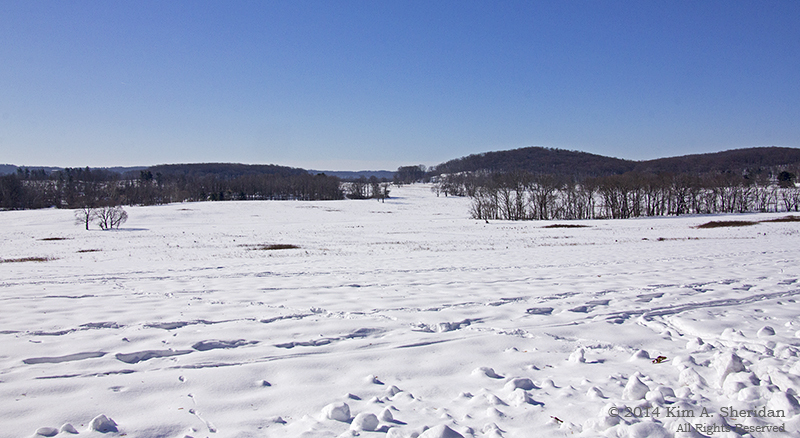 That winter at Valley Forge was neither. Typical of a Philadelphia winter, there were occasional snowstorms, followed by thawing, rain, and then refreezing. The resulting mud and ice interfered greatly with supply shipments. Heavy snow in February was followed immediately by heavy rain, and mud made roads impassable for a time. This was the real hardship the troops faced; not the weather, but the lack of supplies, particularly clothing adequate to the winter conditions. The lack of a true Quartermaster made the situation worse. Sanitation was also an issue. Springs and streams provided water, but were frequently fouled. 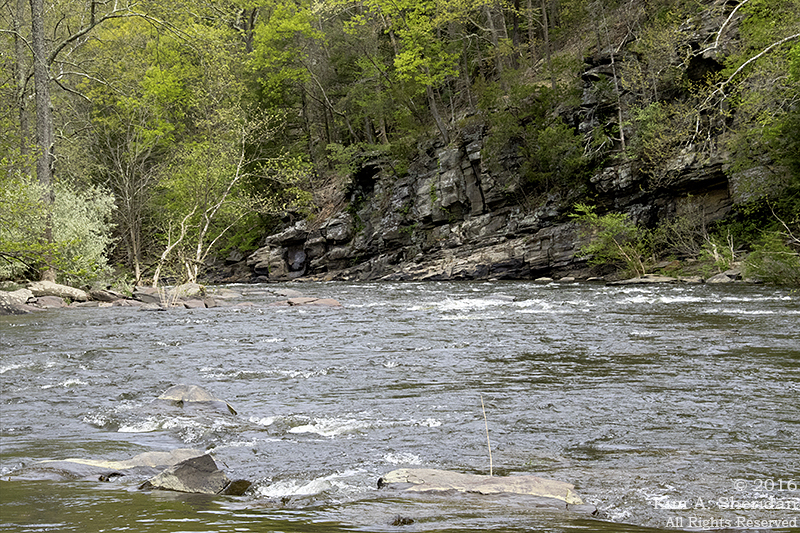 Relief arrived with better weather, an early shad run on the Schuylkill, and the appointment of General Nathanael Greene as Quartermaster. When they weren’t building, serving as sentries, or hunting for wood and food, they were engaged in military drill on the Grand Parade. In February, Baron Friedrich von Steuben arrived in camp, and was given the job of reforming the Army’s training and discipline. He began with the Commander-in-Chief’s Guards, and quickly won them over with his methods. The enthusiasm spread outward as ever large groups of men drilled and maneuvered skillfully. He also greatly improved the sanitation in camp. Far more soldiers died of disease than starvation or cold, and many of the deaths came in the warmer spring months. 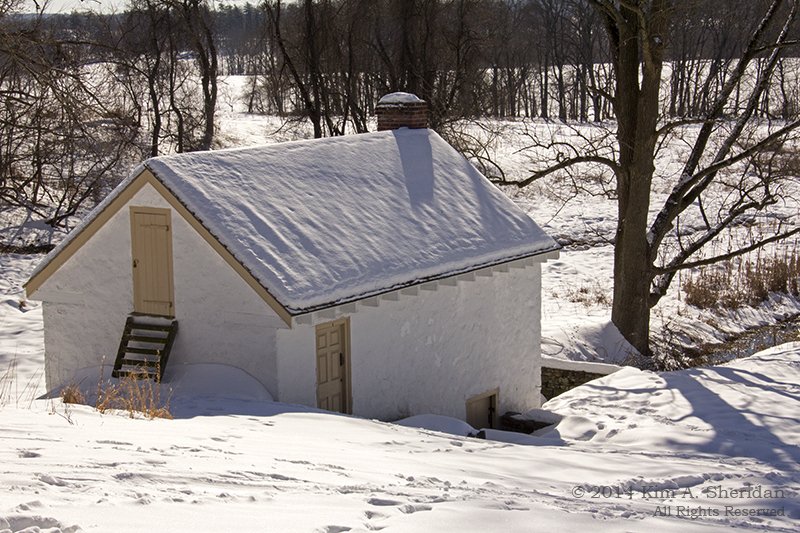 General Washington ordered the chinking removed from the huts to improve air circulation, and in early June abandoned the huts altogether, moving the entire Army across the Schuylkill River to tents. After France entered into an alliance with the United States, the British would abandon Philadelphia for New York. On June 19, 1778, Washington would lead the Continental Army out of the camp in pursuit. 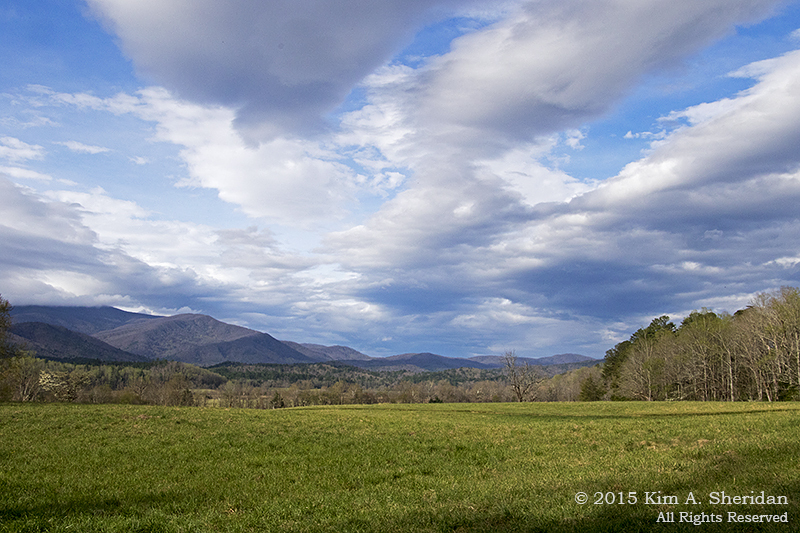 My valley returned to a place of peaceful farmsteads. 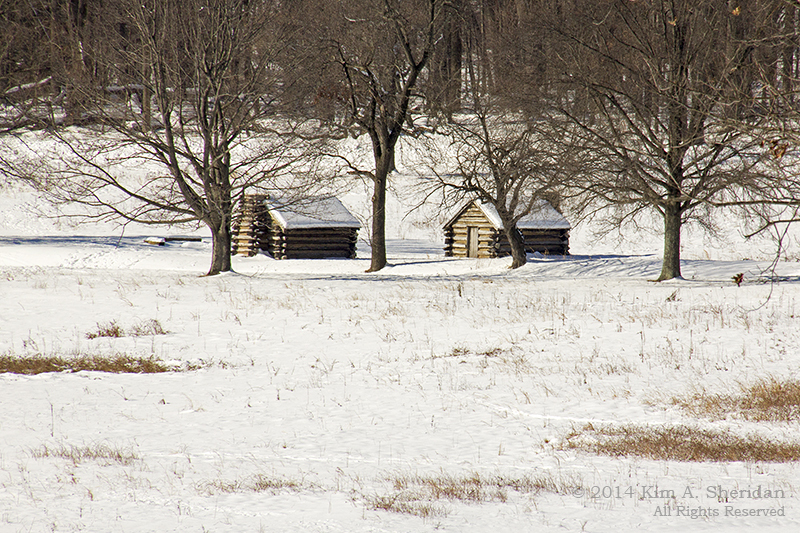 Not a shot fired was fired at Valley Forge in battle. Yet the encampment marked a turning point in the war. France threw in its lot with the Americans. Conditions hardened the men. Von Steuben molded a skilled but inconsistently-trained army into a cohesive professional fighting force. 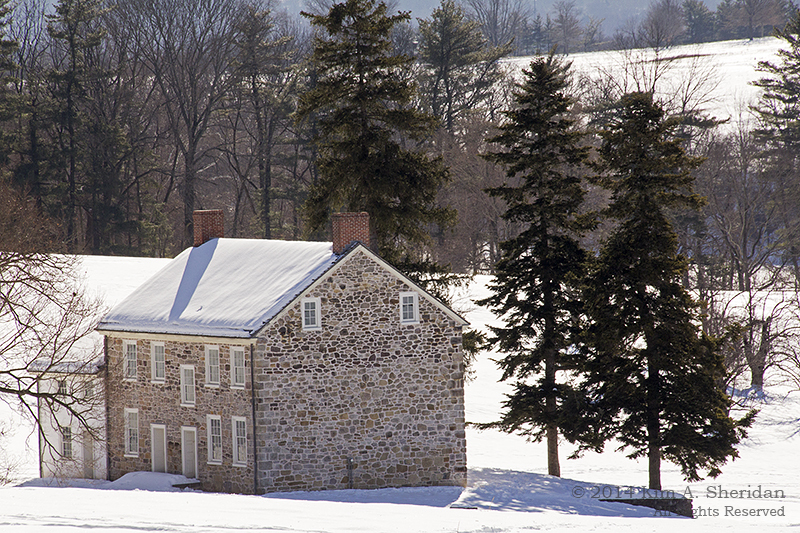 Truly the Army that left Valley Forge was not the Army that arrived six months prior. In the passing years, I have seen the land consecrated by the men that followed, as first a state park in 1893 and then a National Park on July 4, 1776. Many generations have come and gone. Yet I stand here still, my old limbs weary, honored to be a silent sentinel watching over the valley that forged a nation. Okay, class, settle down and pay attention. 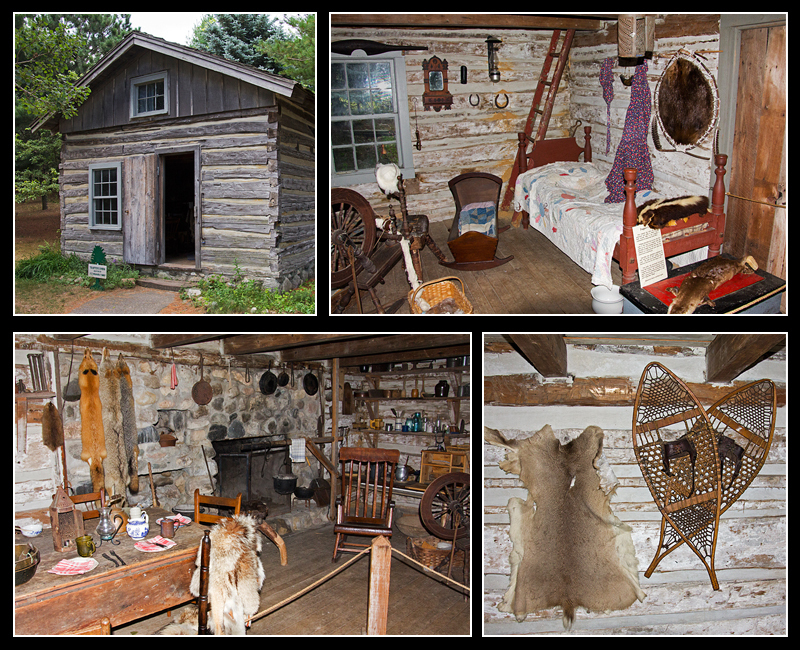 Today’s lesson is history, and our field trip to Historic White Pine Village will give us a glimpse of life in 19th century Mason County, Michigan… Walk the paths and explore the buildings of a logging and farming community frozen in time. Let’s take a tour, shall we? Stay together, please! 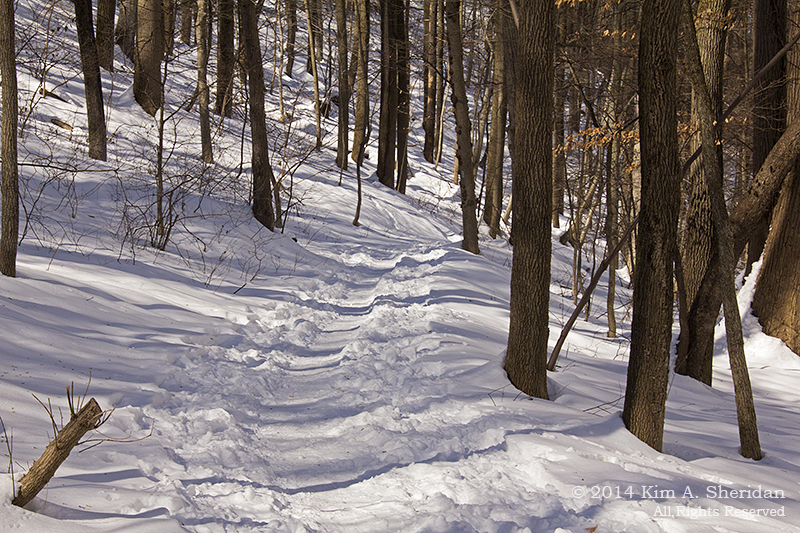 The first Europeans to arrive in Mason County, Michigan – around 1835, before it was Mason County – were the trappers. 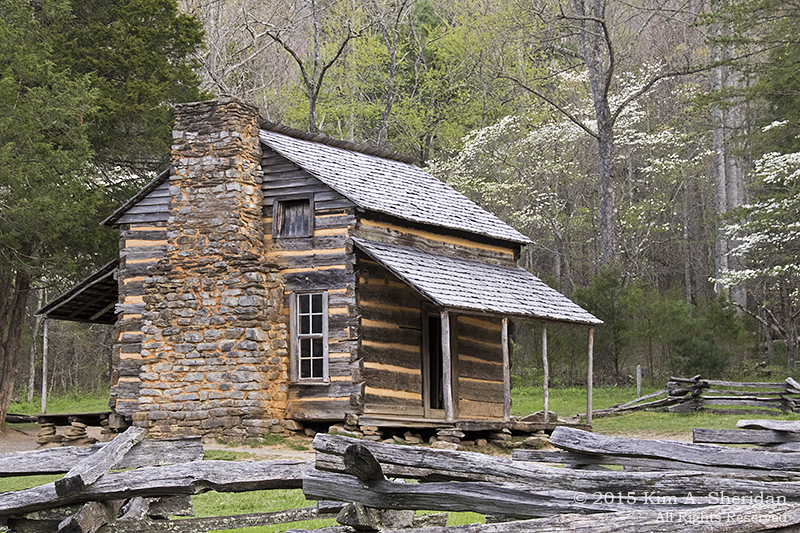 Foremost among them was William Quevillon, who built this log cabin in 1850. Five years later Quevillon was appointed postmaster, and this tiny cabin became the first authorized post office in Mason County, while still housing a family of six. Think your mail is slow and expensive? Postage on a letter to a nearby town was 50 cents, and mail was delivered just four times a year! 1847 saw the first permanent settlers. Burr Caswell, his wife and four children arrived by schooner. With no proper harbor at the time, the family’s livestock had to swim to shore. The coast was a dense wilderness of tall pine trees, wolves and other critters, and the closest settler was in Manistee, 30 miles away. Did I mention it snows 90” a year here? 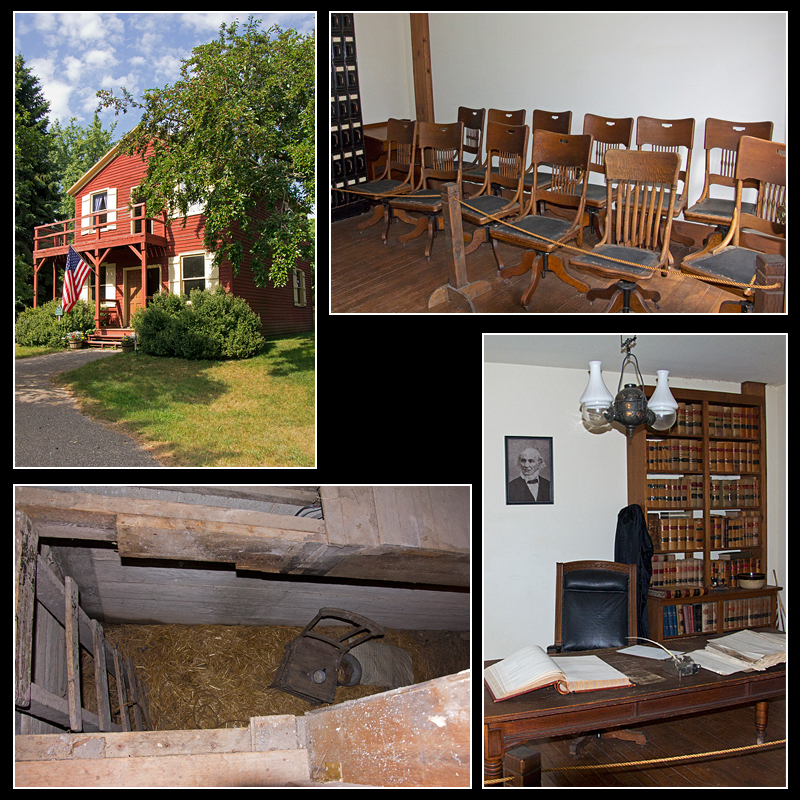 By 1855, there were enough settlers to form Mason County, and Caswell’s frame house did double duty as the county seat. With the family upstairs, the main floor became the courtroom. The jail was this comfy space in the basement. 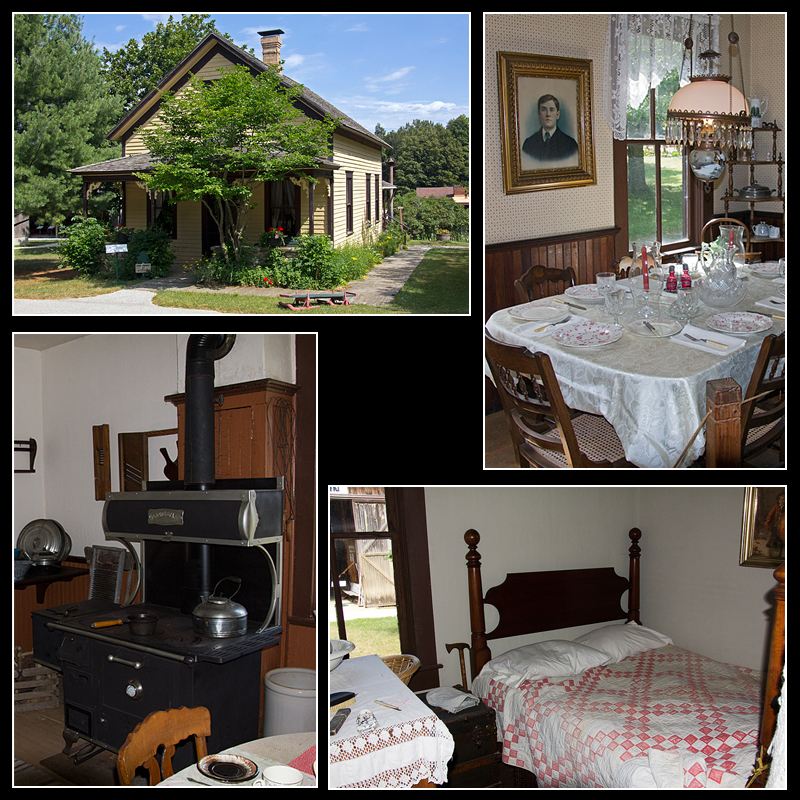 The county seat moved to Lincoln Village in 1861, and the Caswells got their home back. With all those tall pine trees, it was inevitable that lumbering would become the predominate industry in the area. The first mill was built on Pere Marquette Lake in the late 1840s. Other mills followed -14 on Pere Marquette Lake alone – and by the 1870s, business was booming. 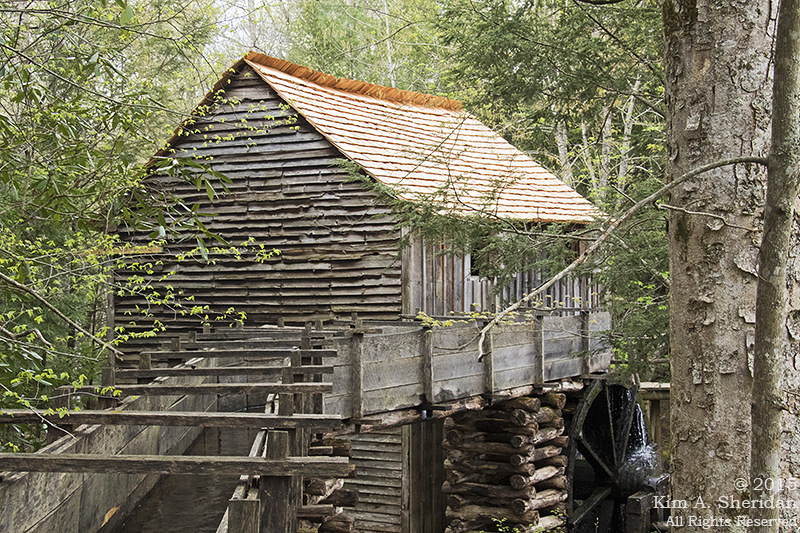 The sawmill shed pictured holds a 48’ portable sawmill that would have been moved from camp to camp. The railroad arrived around 1875. 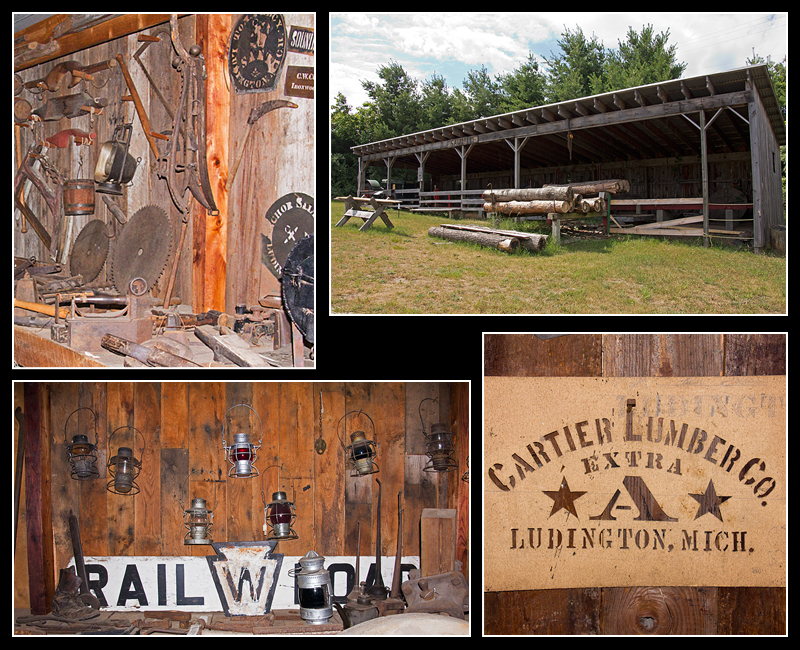 Competition was fierce among the lumber barons, but by 1910, the lumber industry was collapsing, as the timber supply had become completely depleted. In a lumbering community, fires were a constant threat, so fire departments were needed. Ludington’s first fire house was organized in 1883. 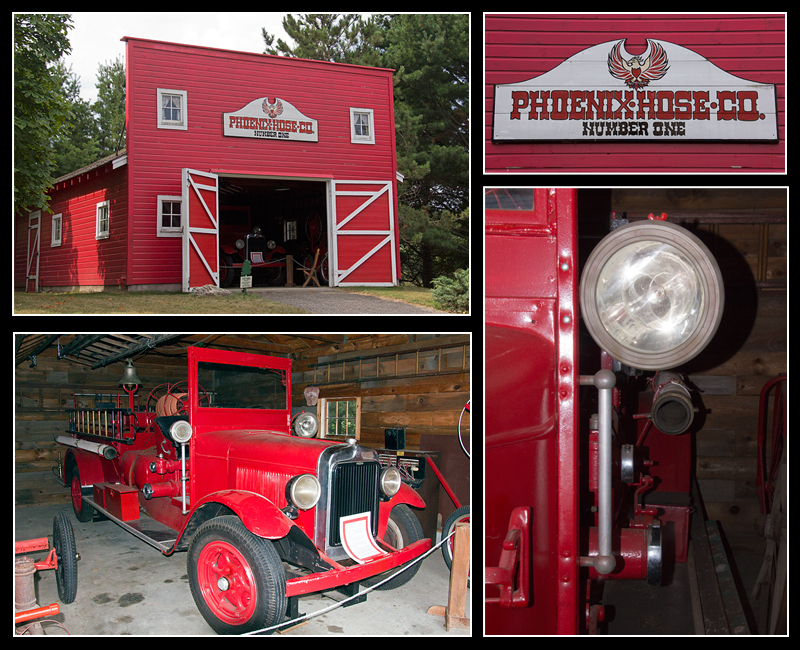 The fire engine is a 1928 model. Farming was and continues to be very important in Mason County. In 1880, Thomas Burns Sr. paid $1,190 for 80 acres of land to raise apples, peaches, cherries, vegetables, chickens, cows and grain. 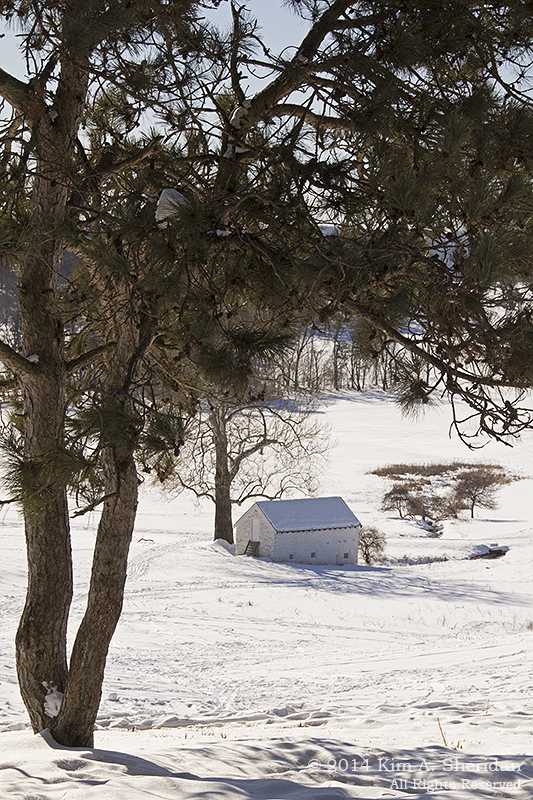 Thomas and his wife Mary had nine children, all of whom were needed to keep the farm running. 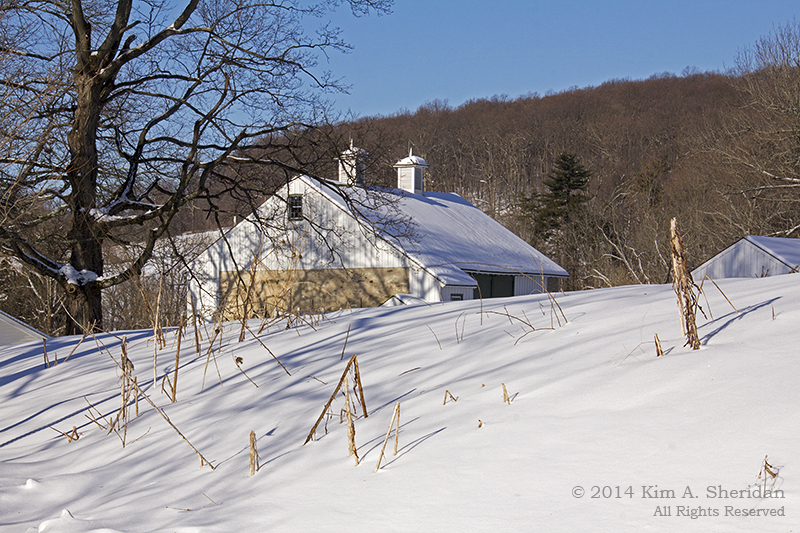 Cooking was done on a wood stove, washing on the back porch, and – ahem – other things in the outhouse. The tiny bedrooms are just barely bigger than the beds they house. 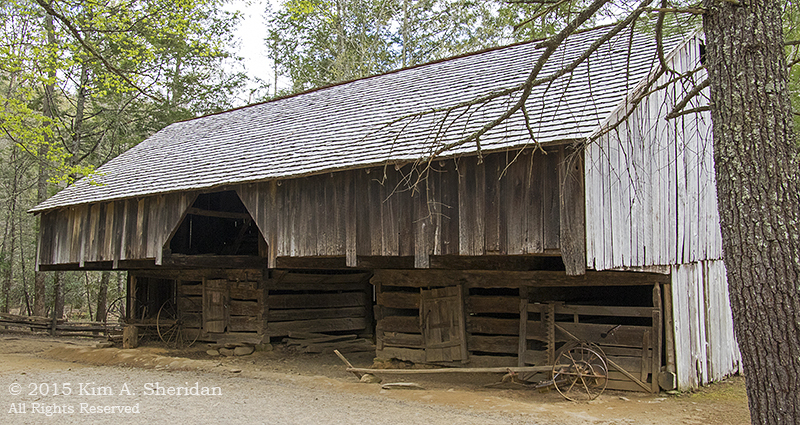 The Burns family would have had a barn similar to this, built without nails. The windmill was used to pump water from the well. 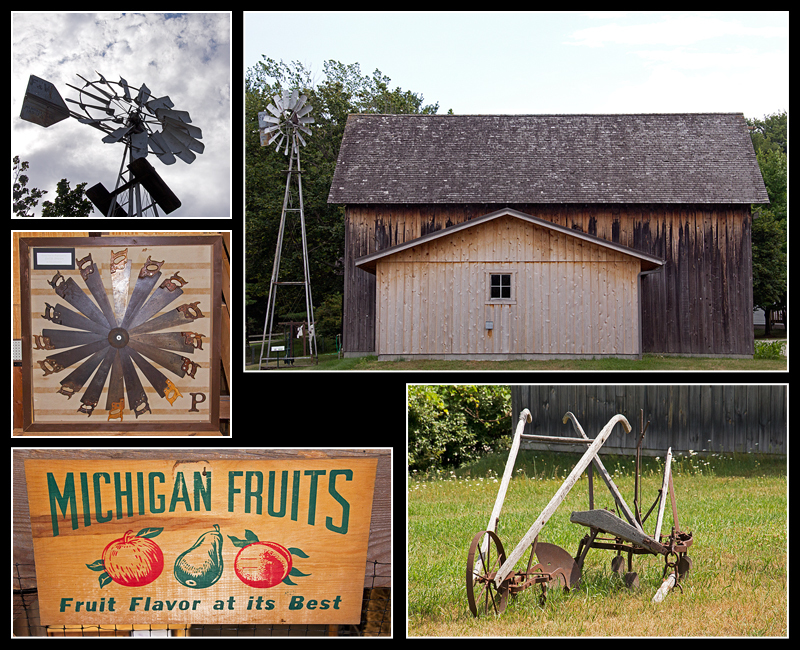 A typical farm would use many pieces of machinery, including plows, hay loaders, grain drills, wagons and corn binders. 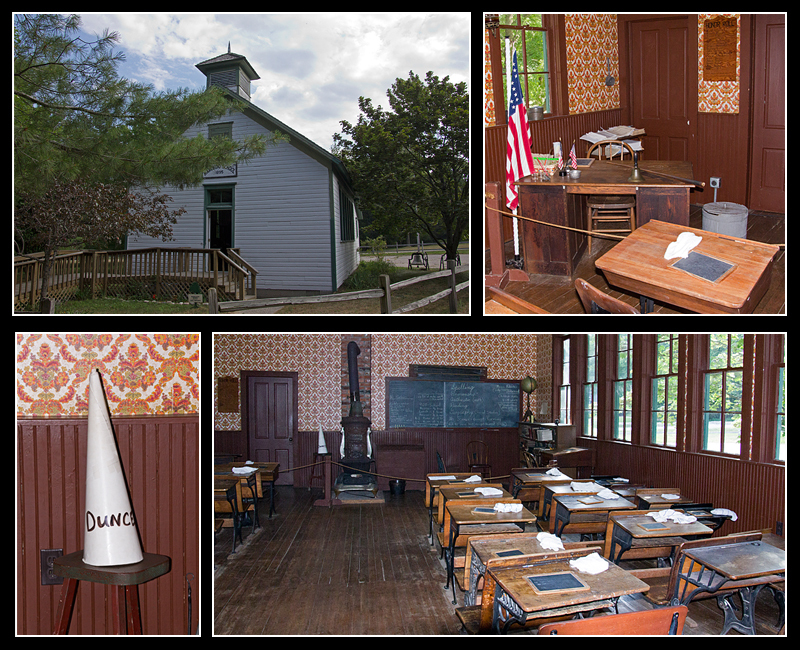 The Burns children would have attended a school – in the winter only – like the Marchido Schoolhouse, built around 1895. Imagine going to school every day here – kids of all ages together with one teacher, wood stove for heat, outside privy. Every child has a slate and desk, there’s a piano in one corner, and even a dunce cap. Better behave yourself! Every town needs a General Store. 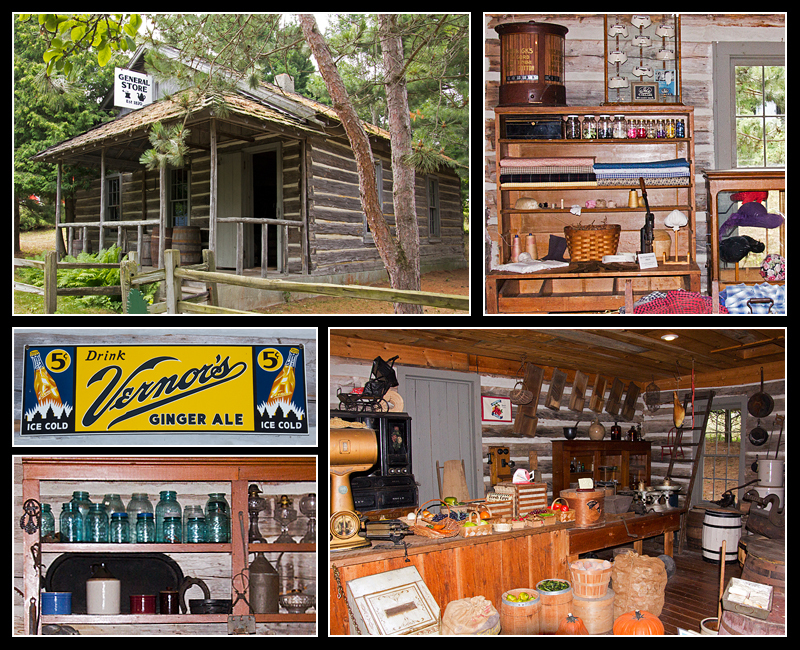 There are all kinds of items for sale here: soaps, spices, dishes, dry goods, barrels of flour and molasses, axes, pots, pens and paper, buttons, even saddles. 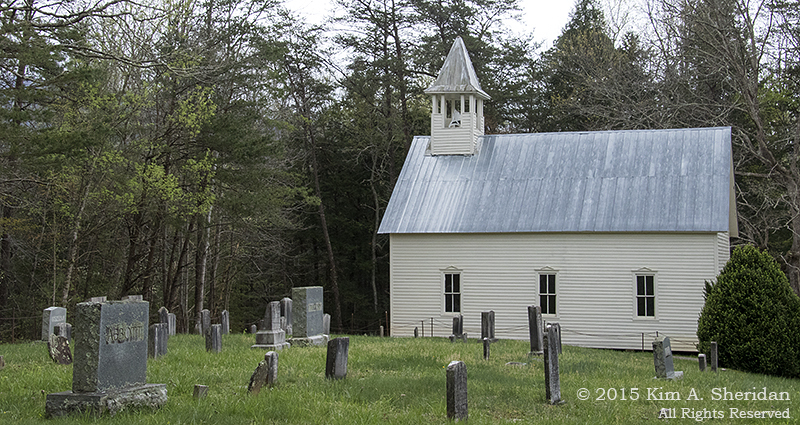 The simple architecture of White Pine Chapel is typical of Protestant churches of the community. 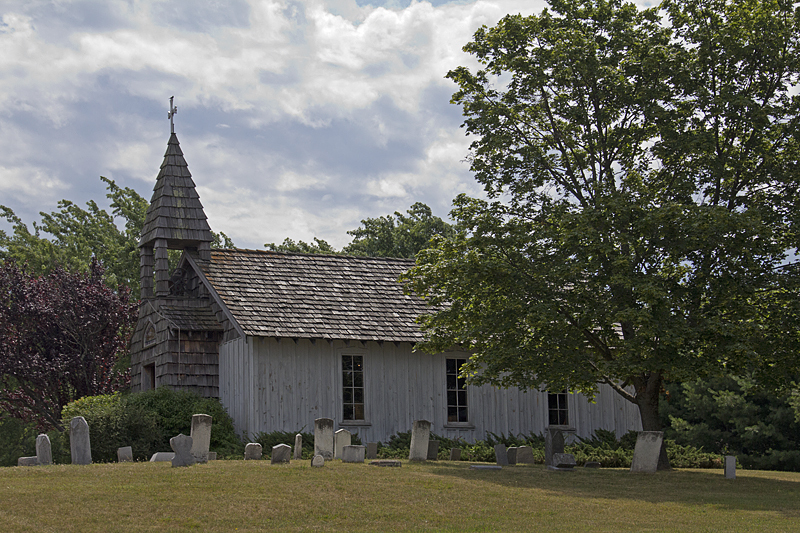 If you’ve visited my Michigan gallery page, you will be familiar with Epworth Heights. To put the Methodist resort in historical perspective, it was founded in 1894, with the first cottages built the following year. Imagine – just 47 years after the arrival of the first permanent settlers, Mason County is popular enough to have its own resort! 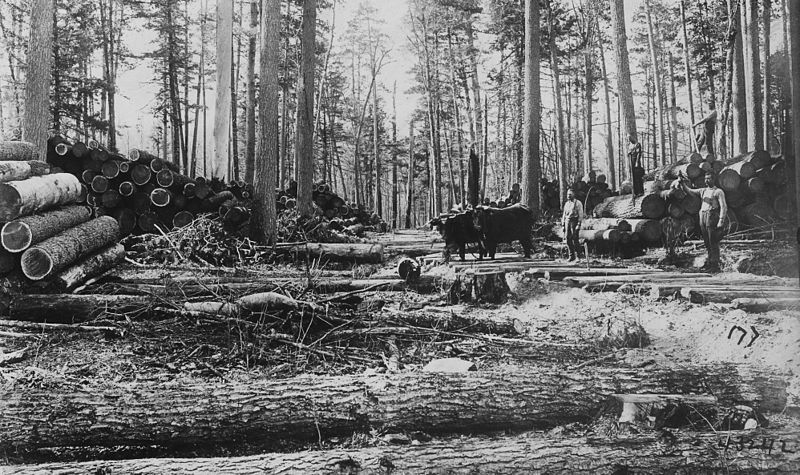 CONSERVATION PIECE: Commercial logging in Western Michigan in the late 1800s had a devastating effect on the environment. Wide scale clearcutting left a landscape of stumps and woody debris; erosion was widespread, and fires frequently broke out. Furthermore, these areas were intentionally burned to provide farmland, which they were ill-suited for. 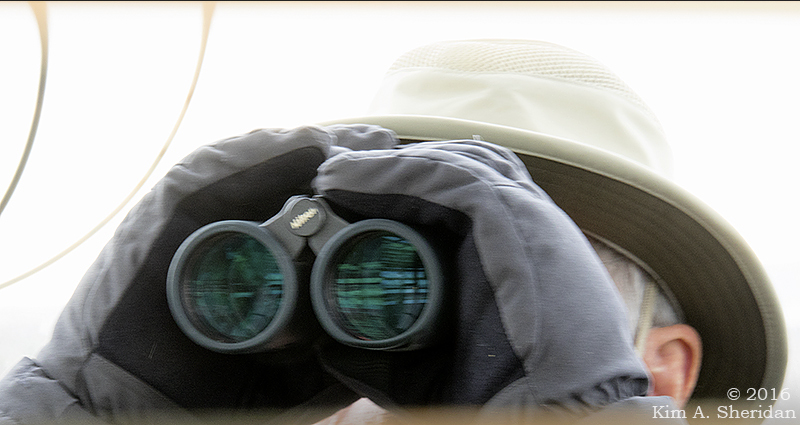 Fortunately, wiser minds began to see the danger, even while the destruction was going on. 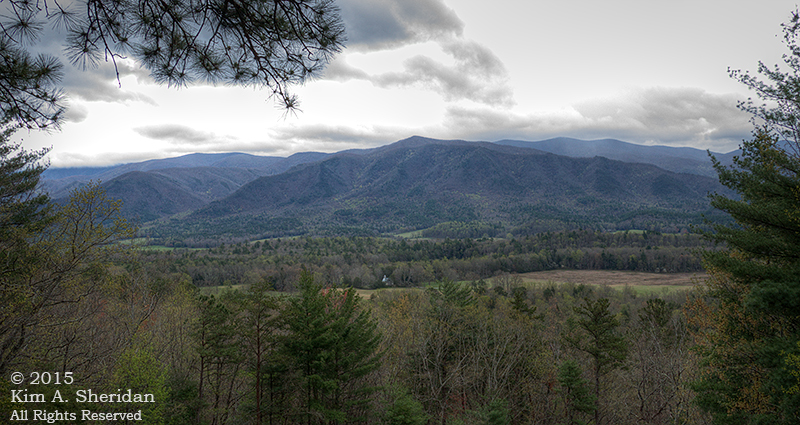 In 1887, the Forestry Commission was formed to protect and restore the state’s forests, three years before lumber production would reach its peak. 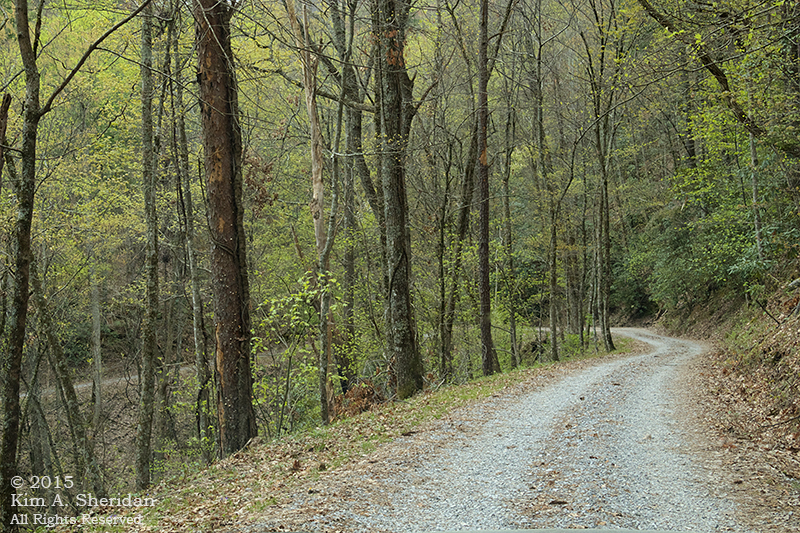 In 1900, state reserves were created for reforestation. 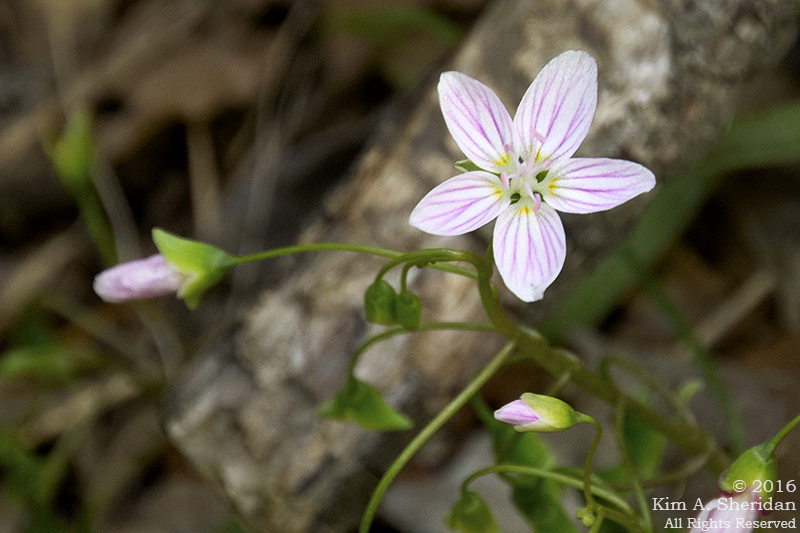 In 1938, Manistee National Forest was formed; it now encompasses 540,187 acres, including portions of Mason County. Today, a large part of the logged areas have been reforested, with white and pine forests replaced by aspen, birch, oak and jack pine. The production of wood and forest products continues, albeit with an emphasis on sustainability and preserving the health and diversity of habitat and waterways. 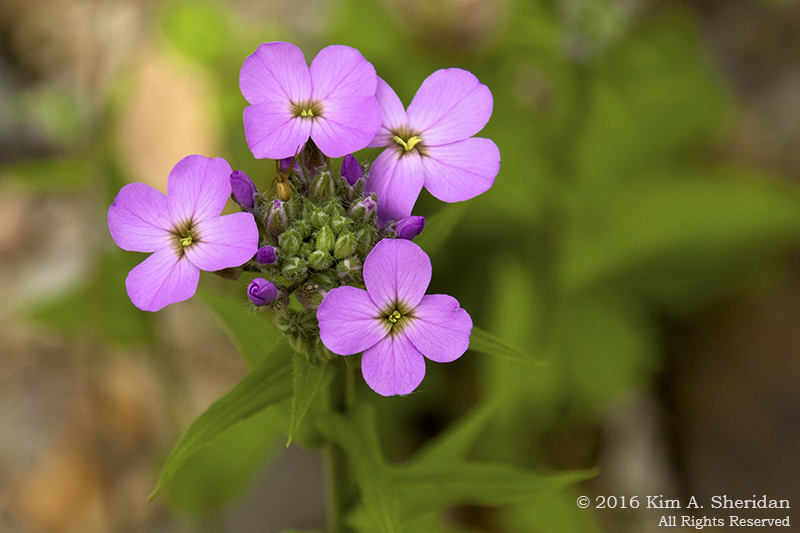 Particular care is taken to protect threatened species such as the Kirtland’s Warbler, Piping Plover, Karner Blue Butterfly and Pitcher’s Thistle. 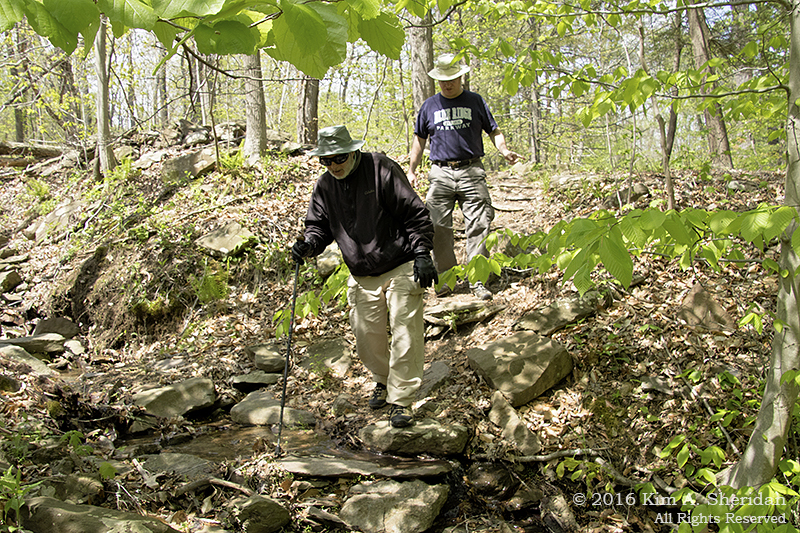 In addition, a wide range of recreational opportunities exist within the forest. 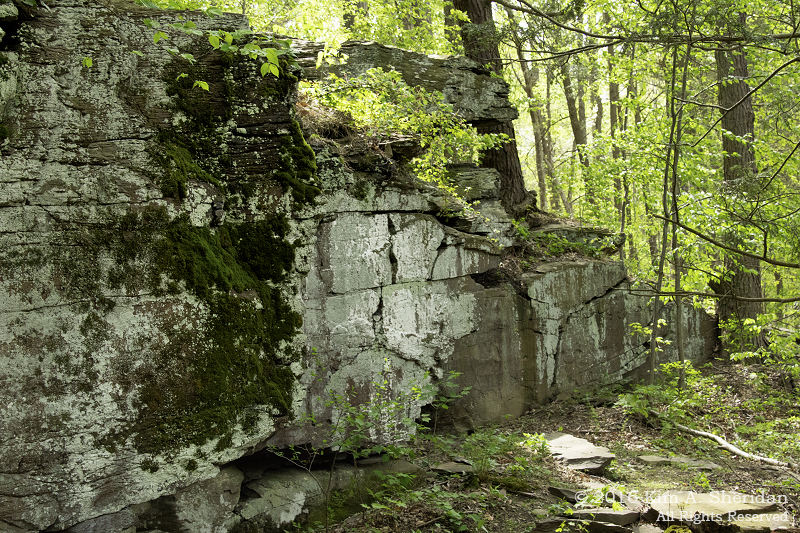 In other words, Michigan’s forests may not be pristine, but they’re a darn sight better than they were in 1890, and the days of uncontrolled clearcutting are long gone.